I had some free time so I decided to escape from the summer heat in Saudi for some cooler British climes. 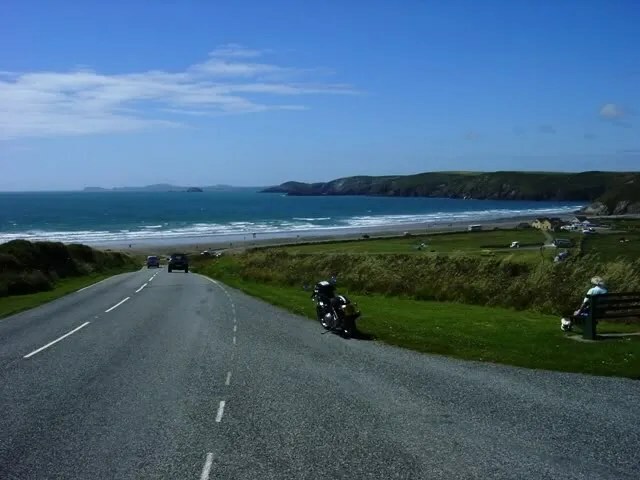 As I had never been to southwestern Wales, I decided to make that my destination. 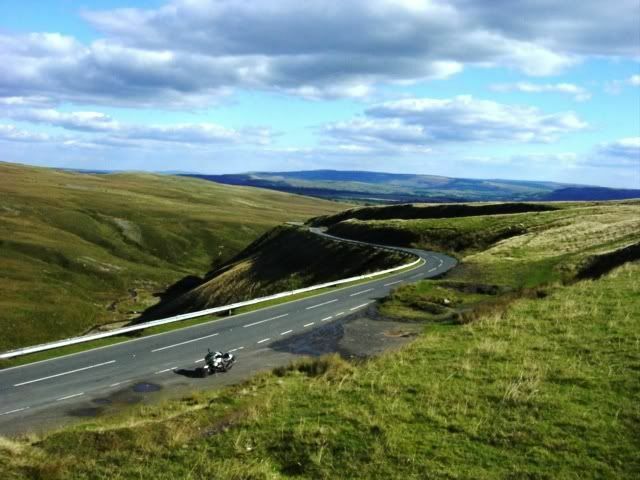 I picked up my trusty Trumpet in Nottingham and made tracks towards the southwest, splitting Birmingham & Manchester. 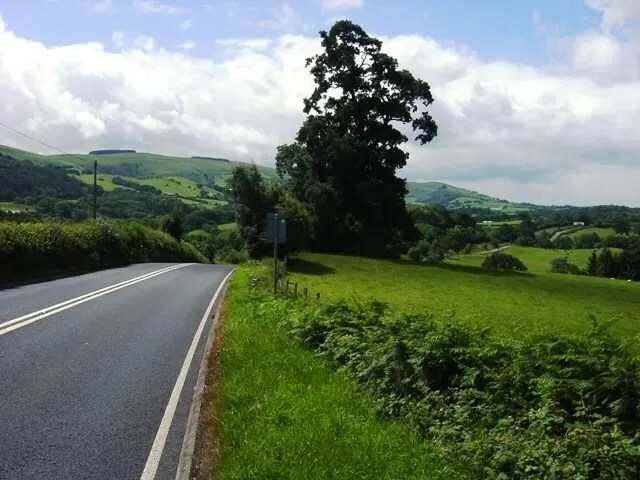 Crossing the Welsh frontier near Newton at midday, I immediately headed south on the fantastic A483. 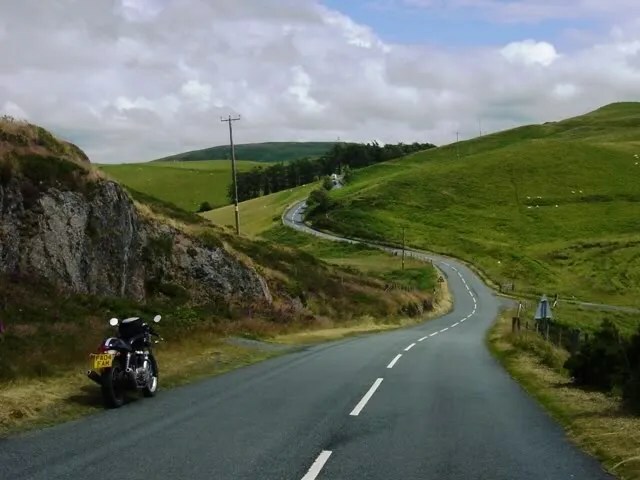 I’ve raved about this road in the past, slicing north to south through Wales, it’s a fun-filled festival of high speed sweepers. 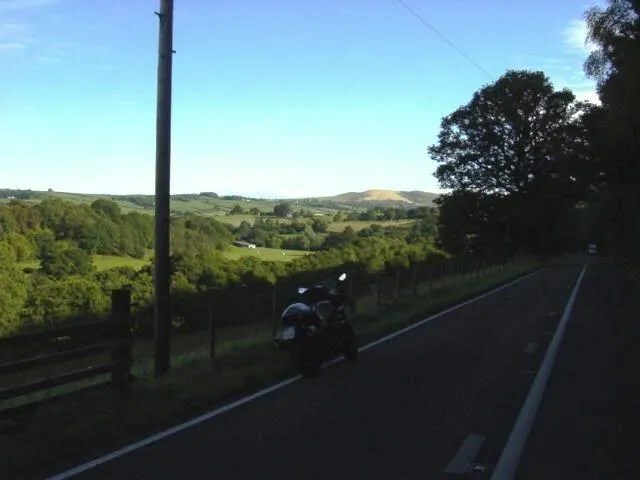 I continue in a southwesterly direction on the A483 under sunny skies, skirting the Brecon Beacons National Park, arriving at Haverfordwest around 4 P.M. After securing a hotel for the night, I decided to make the most of the sunny weather, as the next day’s weather forecast called for rain. 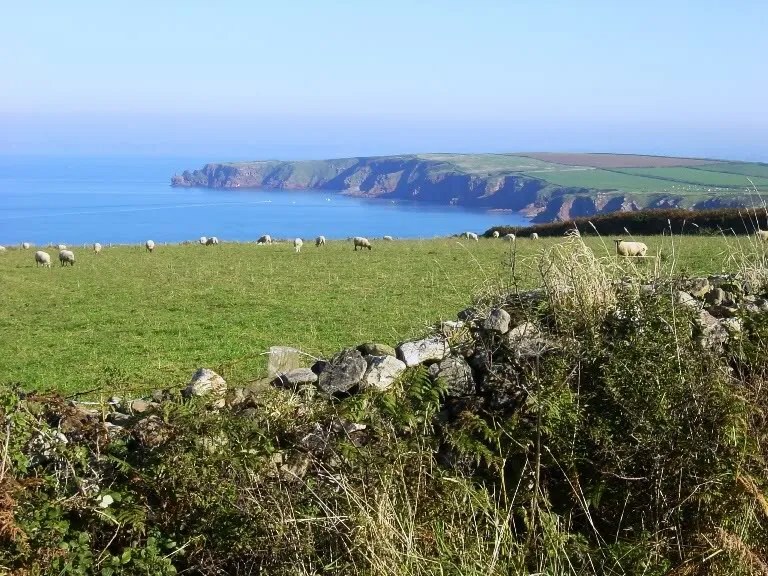 I continued west to St. David’s Head, a headland in the Pembrokeshire Coast National Park. 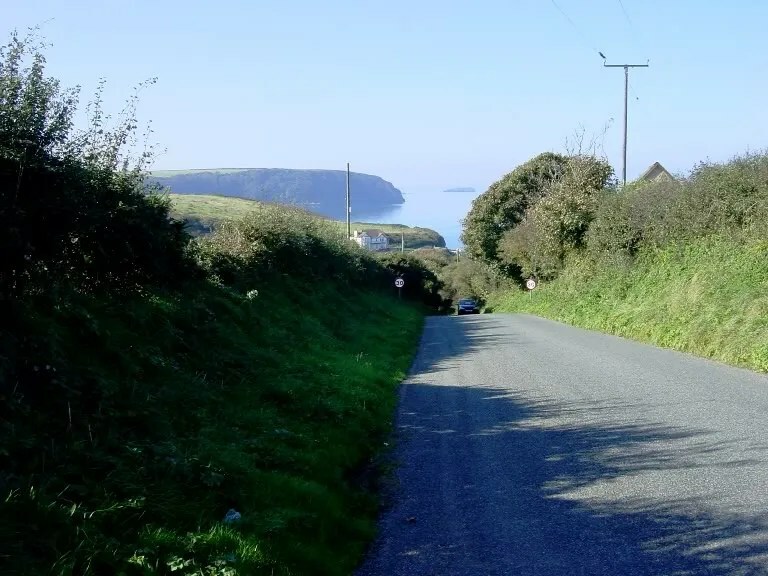 Near Solva, I catch a glimpse of St. 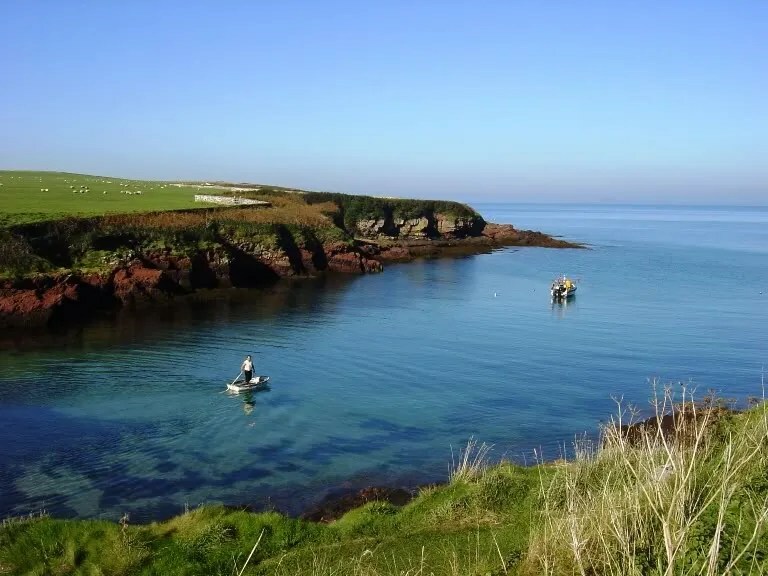 Brides Bay. 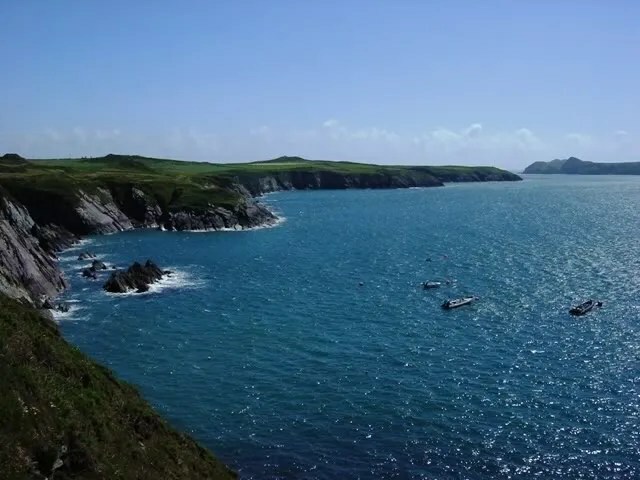 After negotiating several miles of goat trails, I finally make it to St. David’s Head. 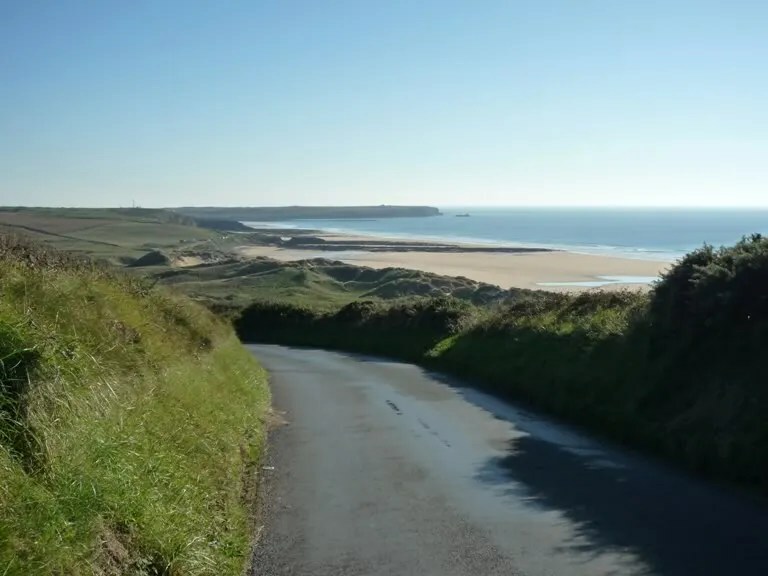 Looking south along the rugged coastline. 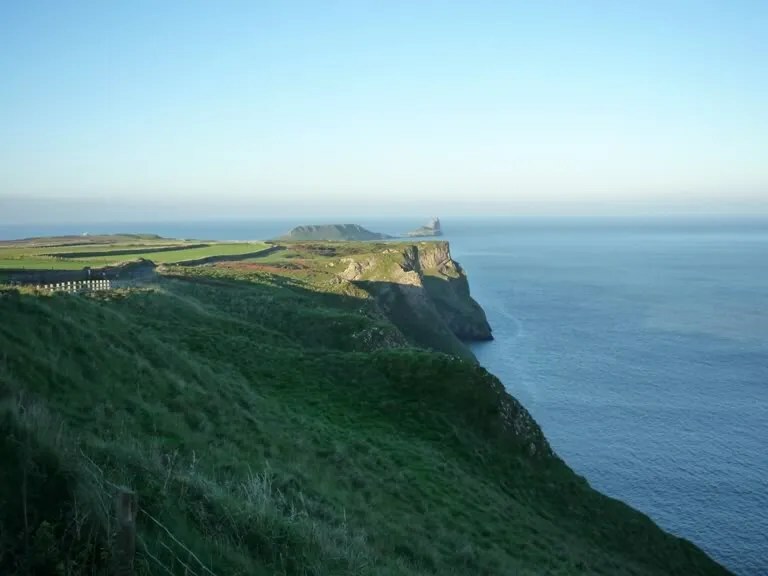 From this point, I turn and head northeast, following a small, single track lane along the northern edge of the peninsula. 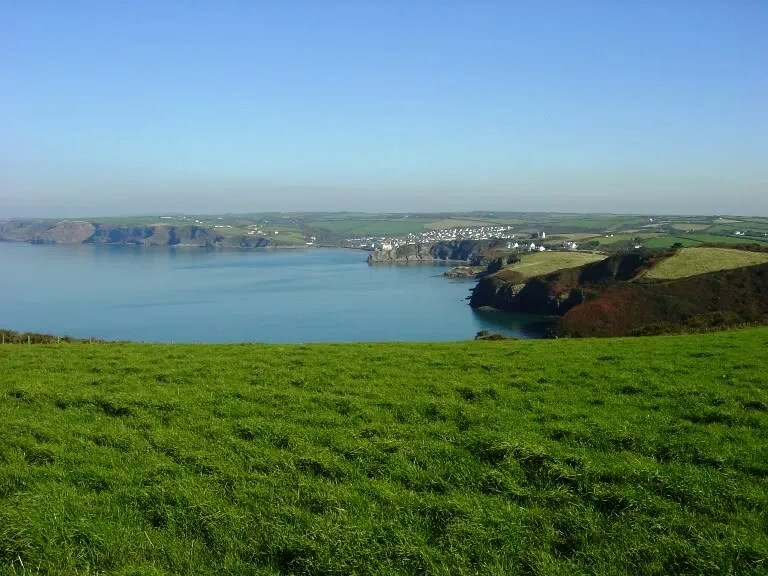 The Pembrokshire coastline, is the only part of the British coast dedicated as a national park and I can see why. I thought it was nicer than even the rugged Cornish coastline. 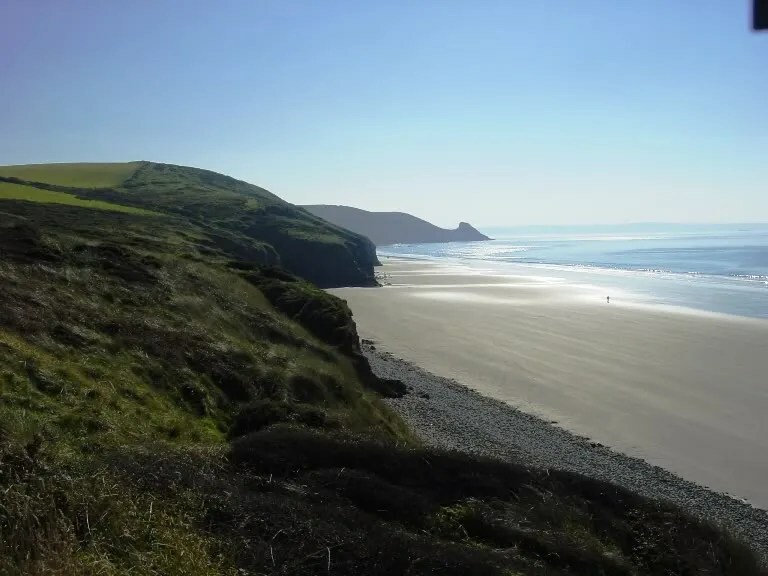 Another shot of the coast. 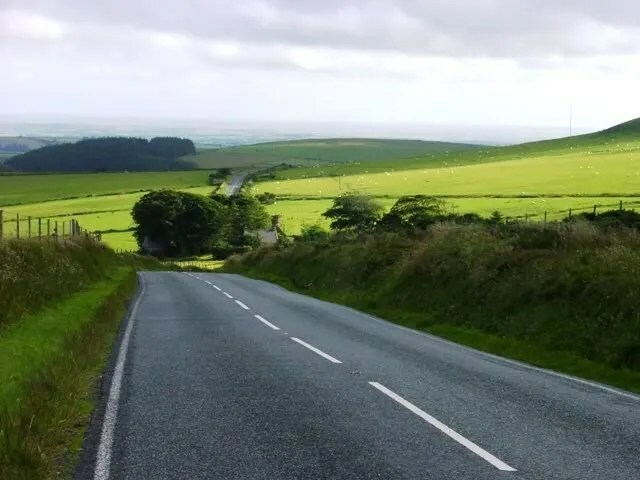 From the coast, I began to make my way inland through the Preseli Hills. 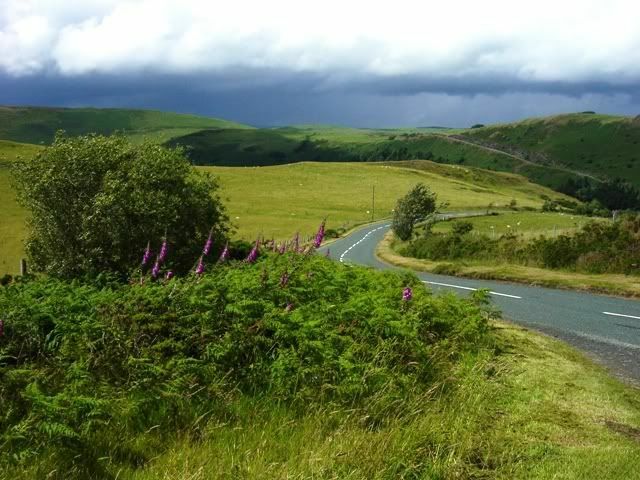 The Preseli Hills are often referred to as mysterious, haunting or atmospheric. 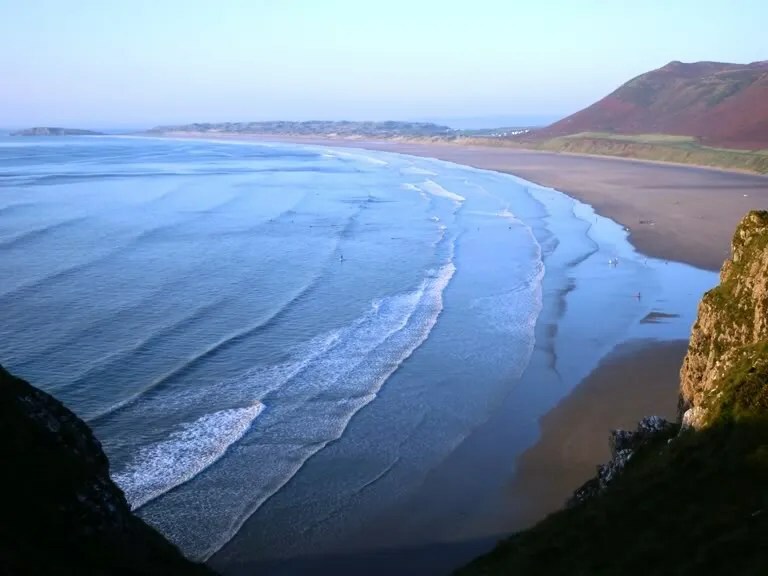 A place where strange things have occurred and where the waters are reputed to have healing effects. 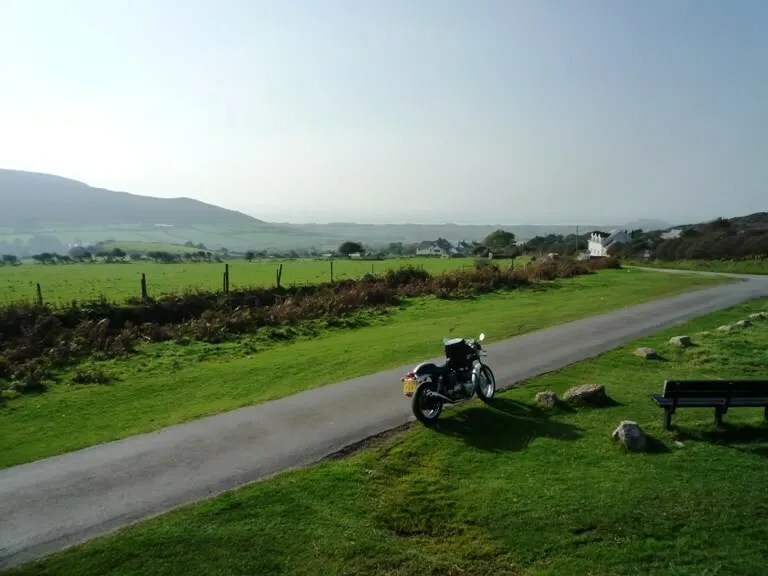 The bluestones used at Stonehenge, have been traced to the Preseli Hills. The stones, weighing up to four tons, were somehow transported some 250 miles to the plains of Salisbury. 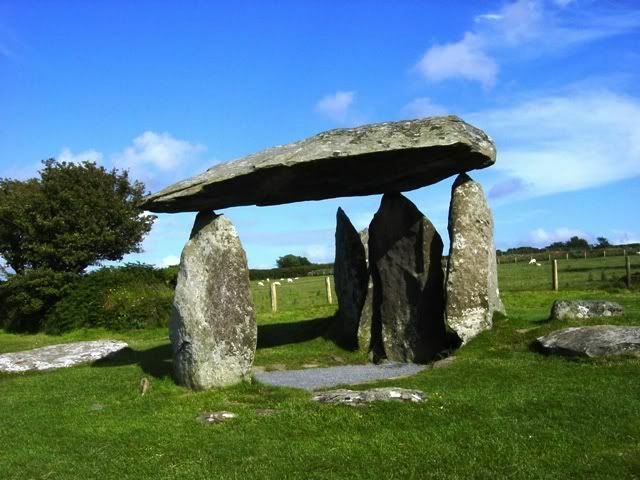 An ancient dolmen, Pentre Ifan is also located here, overlooking the Irish Sea. Dating from 3500 BC, this was supposedly a communal burial ground. 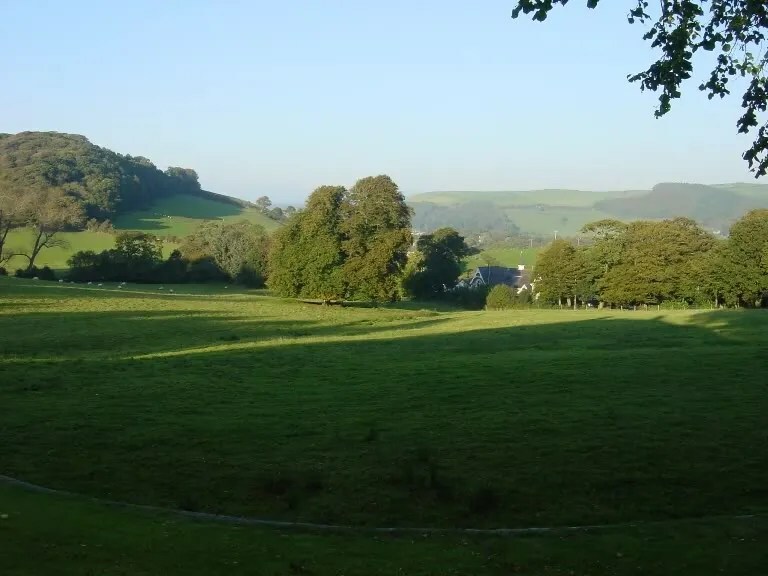 Originally a small mound surrounded the stones, explaining how the massive capstone was put in place. 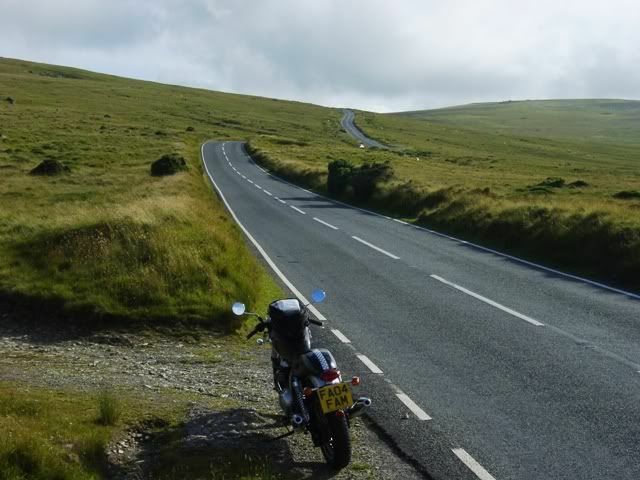 It was now getting late in the day, so I began to make my way down the Preselis to the hotel near the coast. The next day was raining as per the forecast. It’s never good when the weatherman uses words like Biblical and flooding. 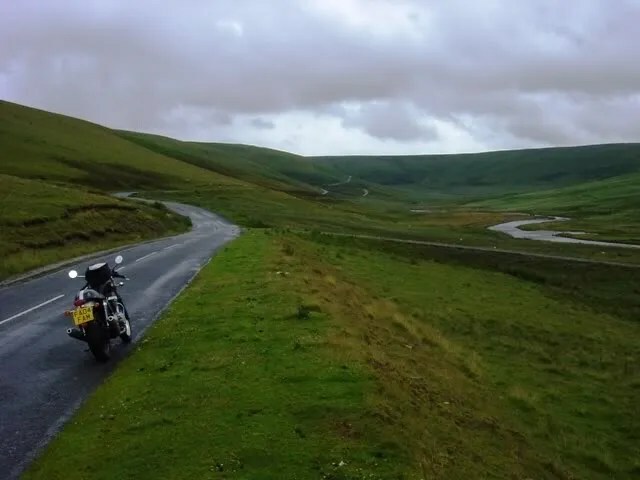 This was supposed to be fun, so I made a command decision that watching STNG and eating Cornish pastys out of a paper bag was more enjoyable than riding all day in the rain. 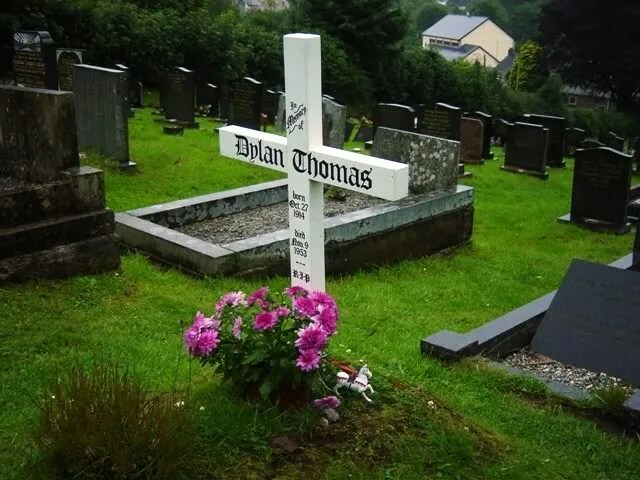 The rain was supposedly going to taper off late in the afternoon, so I decided to go visit the home of Dylan Thomas nearby. A bit of a bohemian, by many accounts, Thomas was a bum, a filcher and a drunkard. His only redeeming feature was his booming voice and his writing, and boy could he write. He apparently made an impression on the New York beatnic scene, so much so that rock stars appropriated his name. In 1953, after another drinking bout, he slipped into a coma and died. He was 39 years old. 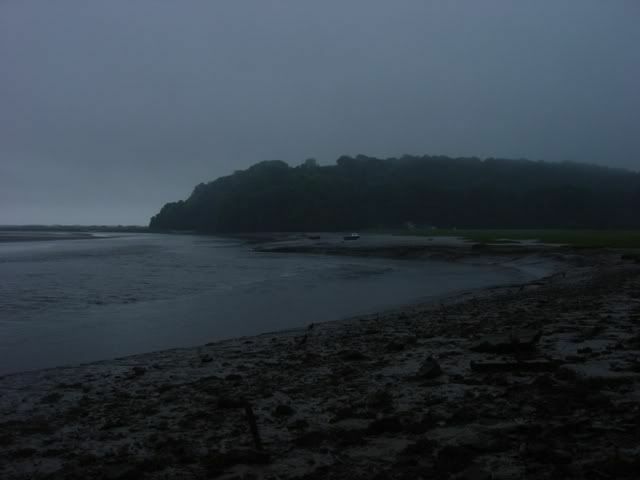 While in the UK, he lived in the coastal village of Laugharne in a house overlooking as estuary where he wrote most of his poetry. 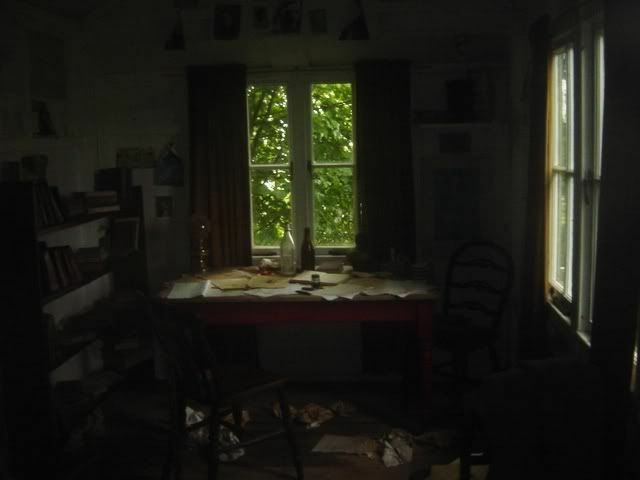 A darkened view of Thomas’ writing shed. The view from the workshop overlooking the estuary. Thomas was buried in the village churchyard in an unpretentious grave. 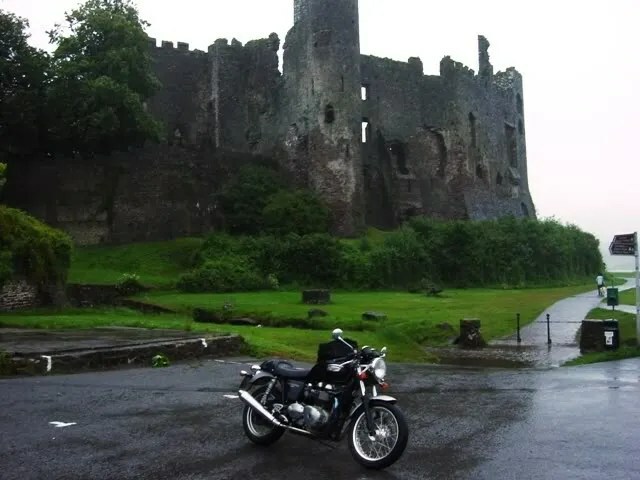 A picture of Laugharne Castle built by the Normans. Wales is dotted with the ruins of many castles, recalling a history etched in violence. The weatherman lied and the rain continued to come down, giving me a good soaking on the way back to the hotel. Day three began with the weatherman calling for “improving” conditions, whatever that means. As I left the hotel, it was still raining but I sought consolation by telling myself “it’s gonna improve”. Three hours later, I was still muttering “it’s gonna improve” as the rain continued to pelt down. I was headed back northwards along the western flank of the Cambrian Mountains. 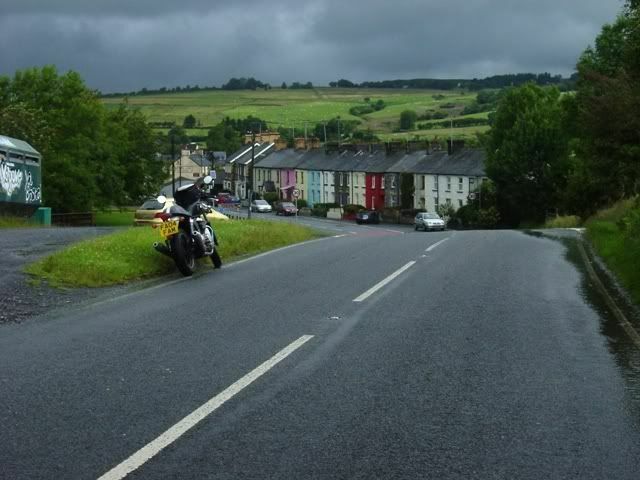 A multi-hued Welsh village. 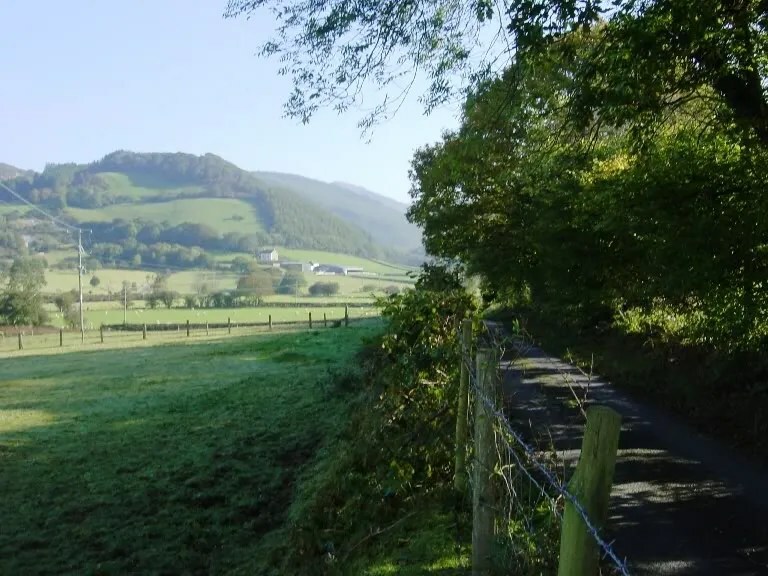 At the village of Cwmystwyth, I cross over the Cambrians along a narrow single track. Finally, at around 3 PM I get a respite, as the sun peeks through. 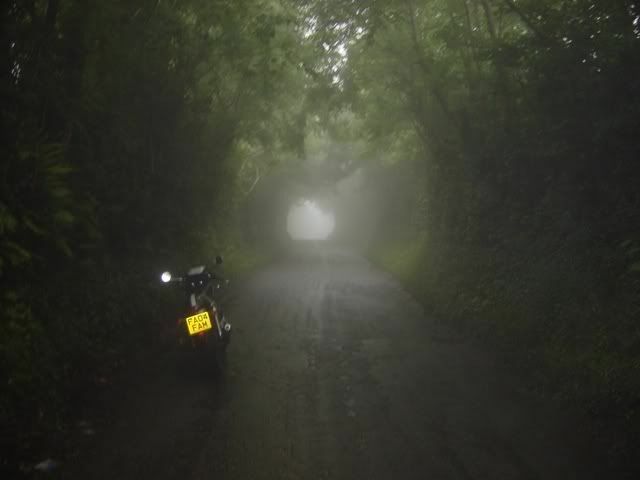 The motorcycle gods are merely taunting me as an ominous darkness lurks on the horizon. 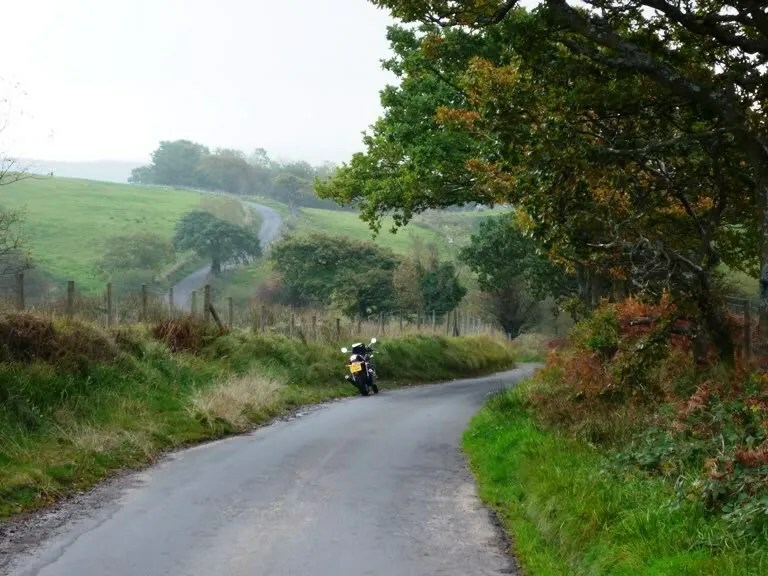 I’ll be the first to admit that the Thruxton is a bit of a poser’s bike, the Triumph struggling to keep up with faster, more powerful competitors on the open roads, yet when the roads become tight and narrow like this, the little twin mill really enters its own element. The engine’s healthy torque is accompanied by what has to be one of the most enjoyable soundtracks in all of motorcycledom. 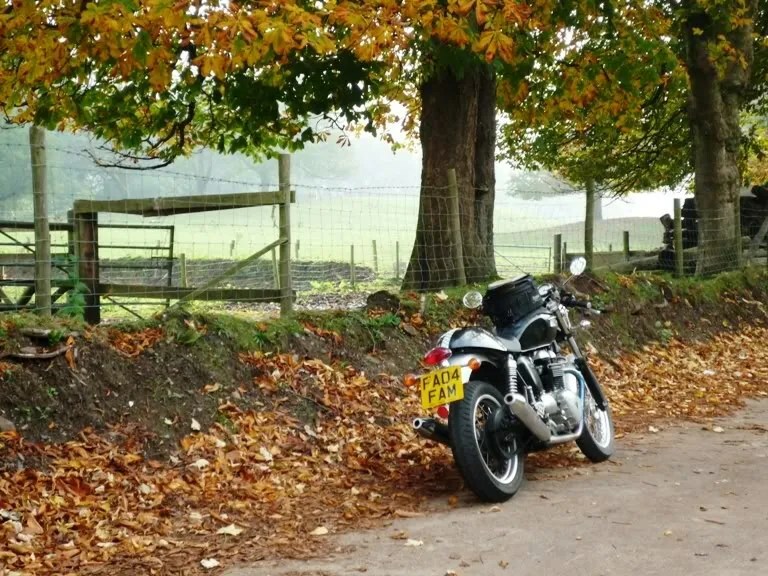 The twin’s snarling bark never lets you forget you’re on a proper motorbike. 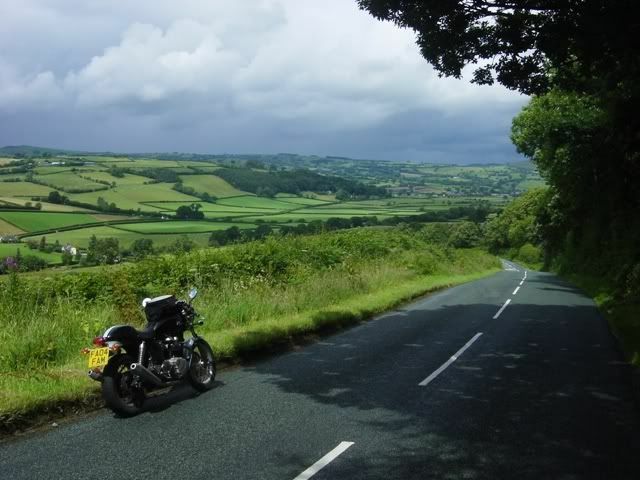 There’s just something intrinsically right about riding British iron on British roads. The two seem to be perfectly compatible with one another. 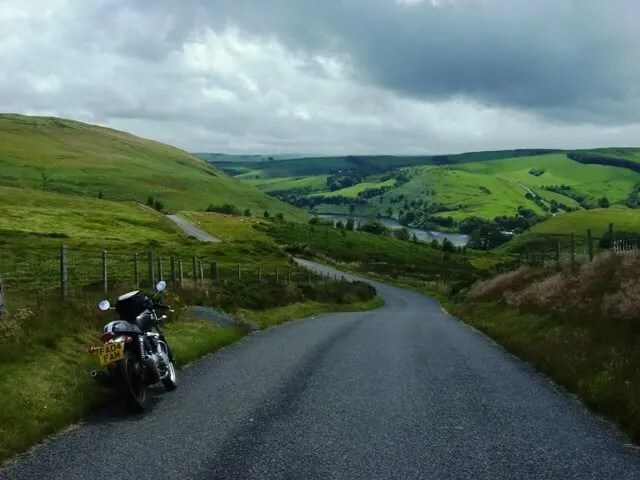 When you’re out by yourself on a lonely backroad, listening to that lovely rumble, it’s all to easy to imagine that you’re back in the 1960s when the British motorcycle industry ruled the world. It’s a shame the engine doesn’t have about 20 more horsepower. Fortunately, I play dodge’em with the rain clouds for the rest of the afternoon, only getting a few sprinkles here and there. At around 4 PM, I pull up and take stock in my situation. I’m soaking wet and right now would be a nice place for a hotel to materialize before my eyes. While staring at the map, I notice a lake with the word “Hotel” written next to it. Strange. It must be nice if it appears on the map. 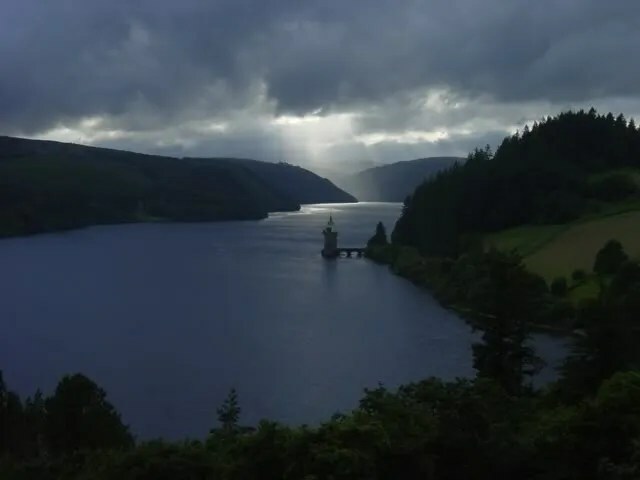 I head towards the lake and, sure enough, there’s a hotel overlooking Lake Vyrnwy. Quite a nice one too. It turns out the Lake Vyrnwy hotel is a former hunting lodge for the city leaders of Liverpool. I get a nice room with a view of the lake. More importantly, the room has a hair dryer so that I can dry out some of my soaked gear. 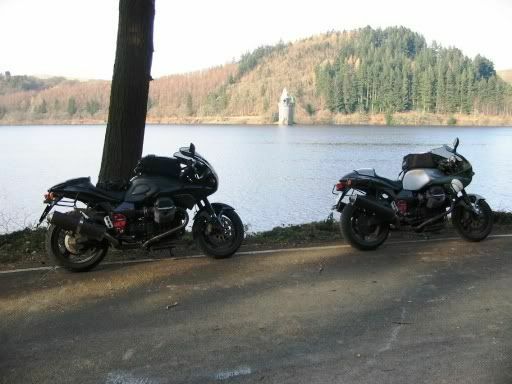 The Beatles drank from these waters, as the lake serves as the reservoir for Liverpool’s drinking water. 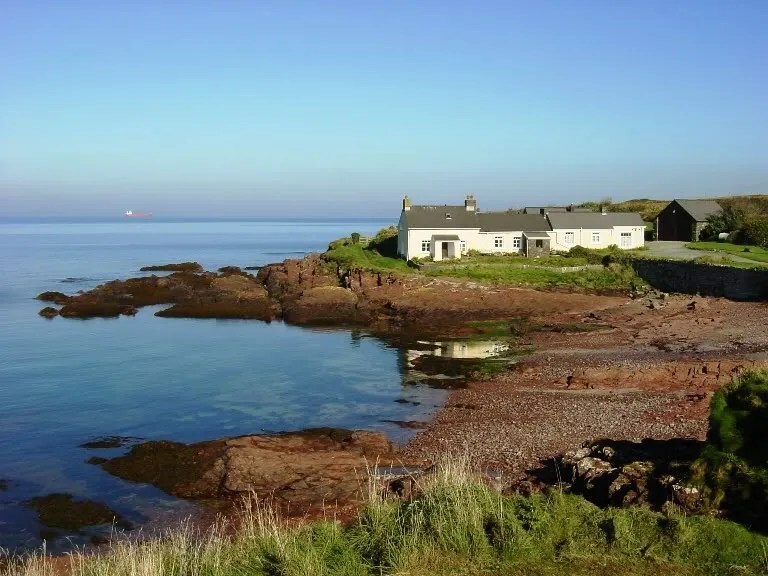 Gerry & the Pacemakers also drank from these waters, so make of that what you will. 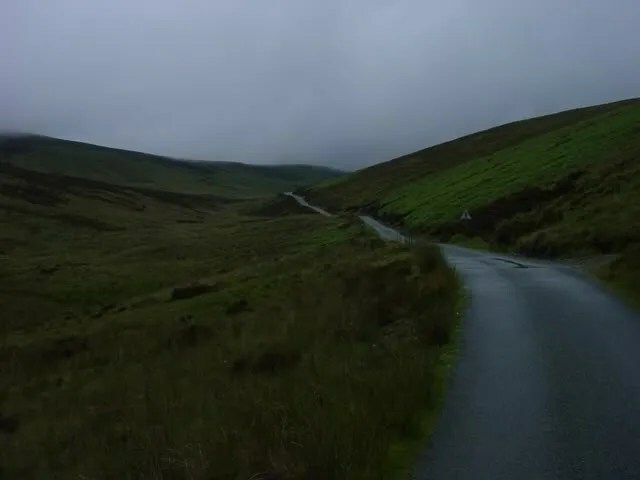 Day four, my final day on the road, began the same as day three, with the promise of improving, but unsettled conditions, meaning “a roll of the dice”. I head north from the lake taking another scenic single track. 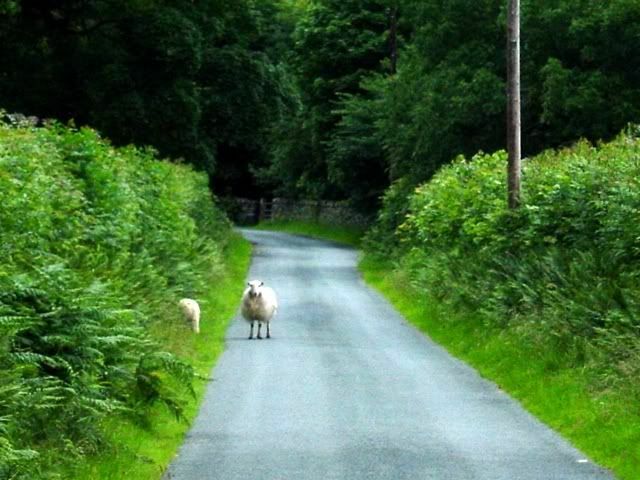 A typical Welsh predator lurks by the roadside. 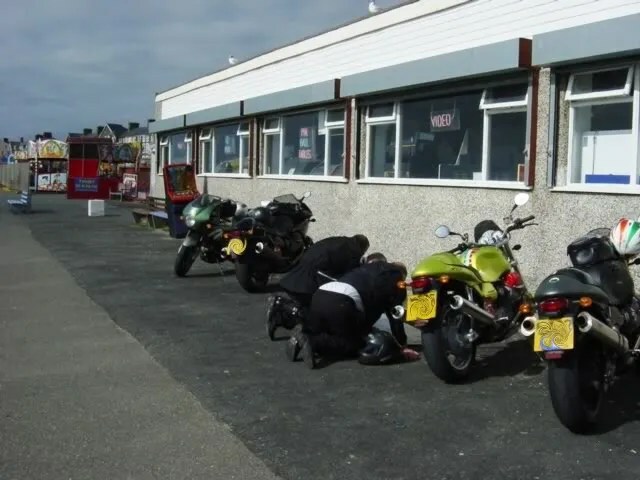 Usually, a blast from the mighty Triumph’s exhaust pipes were enough to send them scurrying for cover. up and over the top and down the otherside. 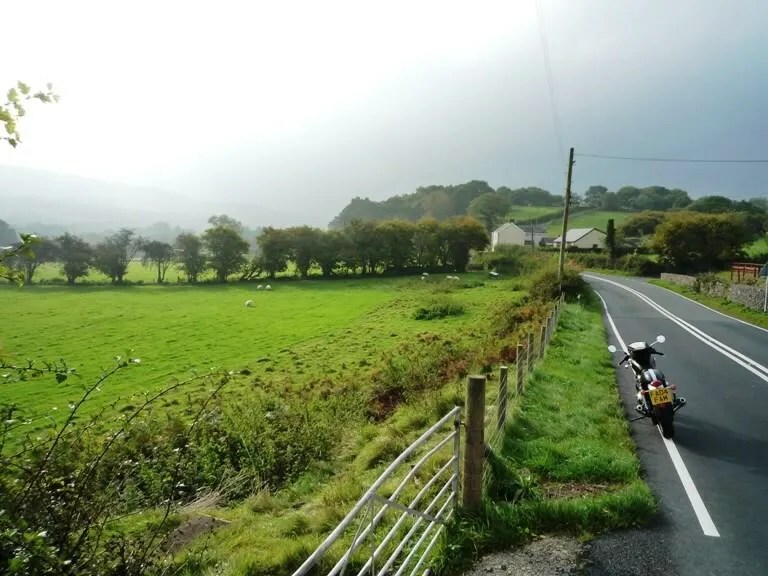 Somehow, the misty weather in this photo perfectly captures the mystical Welsh countryside. A sunny picture just woudn’t convey the same feeling. 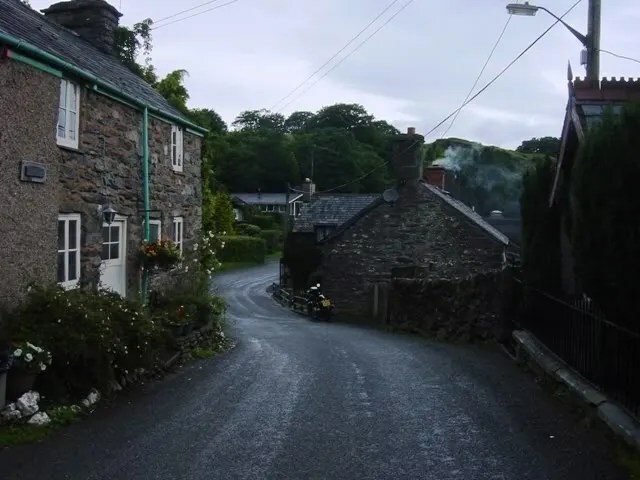 Early morning puttering through a small village as smoke rises from a farmhouse chimney. I find the B4391 and it takes me towards home. 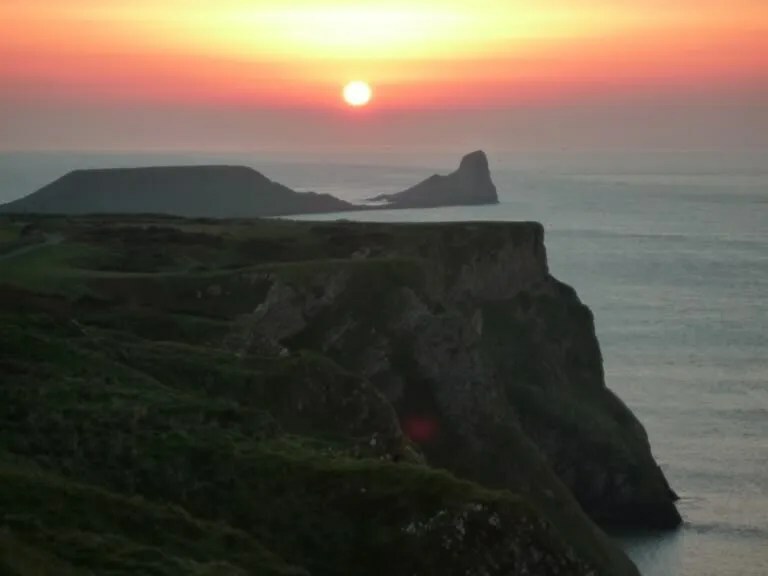 What a nice farewell to Wales! 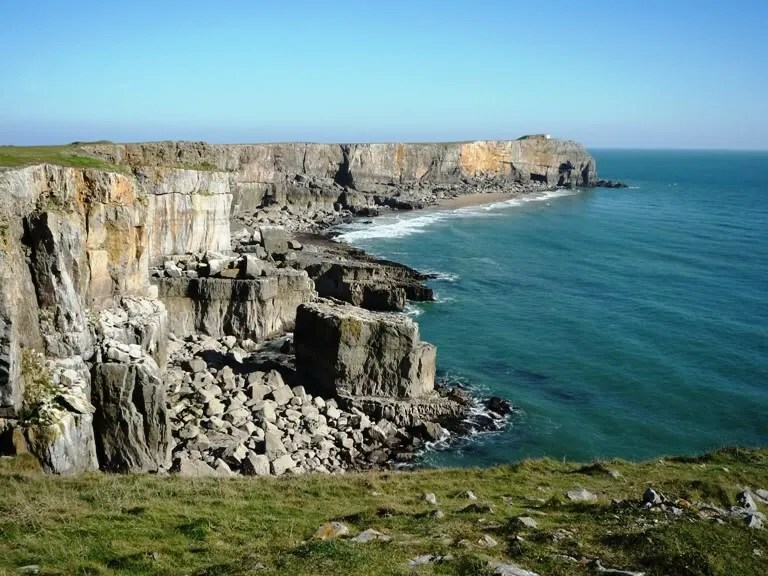 Wales lives up to all its accolades and more. 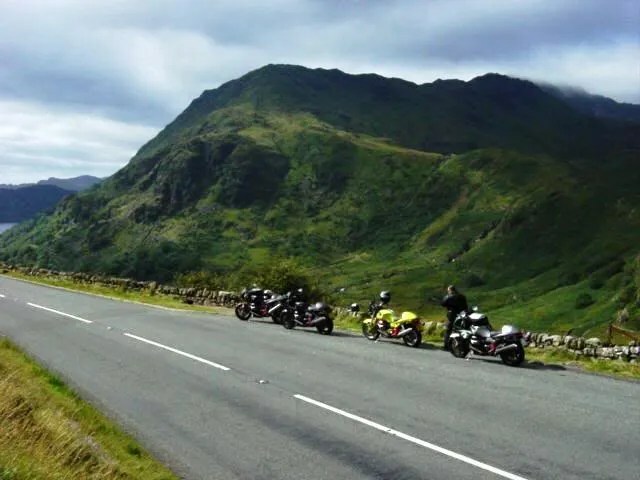 From stunning, fast sweeping bends, to narrow single tracks, the Welsh terrain encompasses all types of motorcycling pleasure with its majestic natural beauty added as a bonus. The people are extremely warm and welcoming, especially after they hear an American accent. 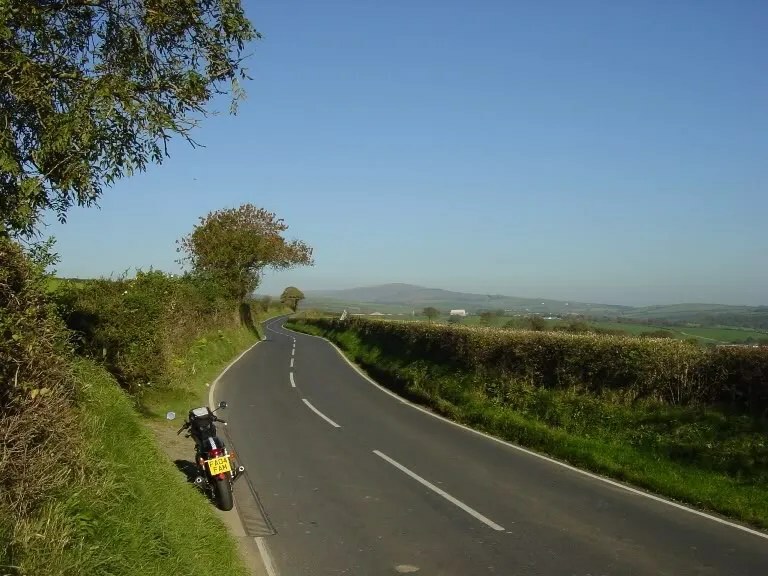 On the way back to Nottingham, I make a small detour to explore some interesting roads in the Shropshire Hills. Mercifully, I was fortunate and managed to escape any major drenchings on the last day. 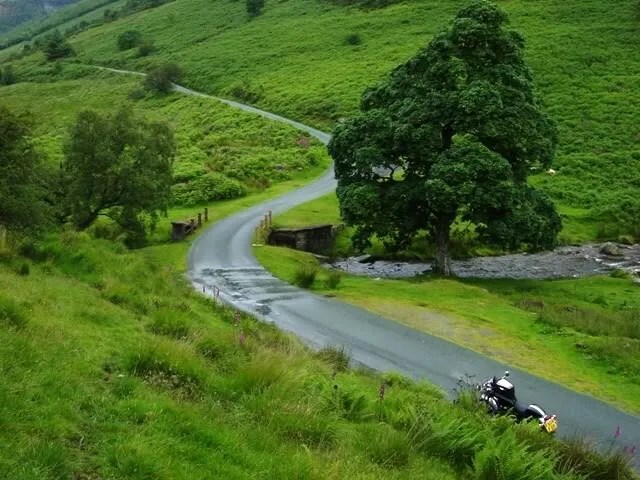 the motorcycle gods must have had their fill of entertainment. Fun for the entire family…that is if mom rides a GSXR. I made plans to meet some of the lads from v11lemans.com at the summit of Horseshoe Pass north of Llangollen. Temperatures are in the 40’s…well below team orson’s level of comfort…but we are on a mission. We soon get acclimated if not completely warm. We comfort ourselves with the thought that 40 degree air is worth some extra horsepower. After another full English breakfast, we take off. 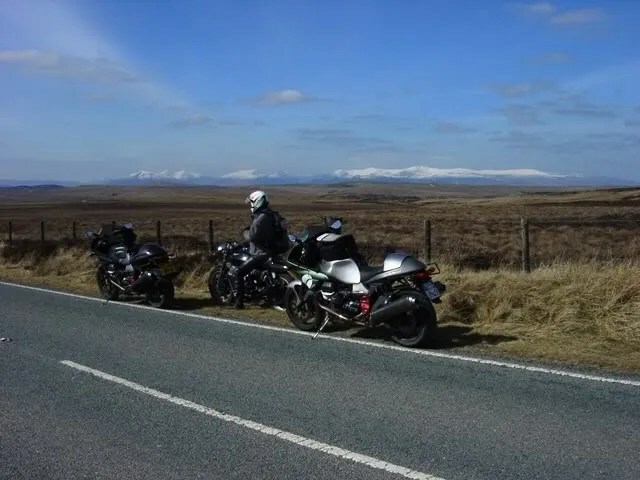 Heading west towards the coast, we stop to take in the snow capped Carneddau Mountains including Snowdonia. 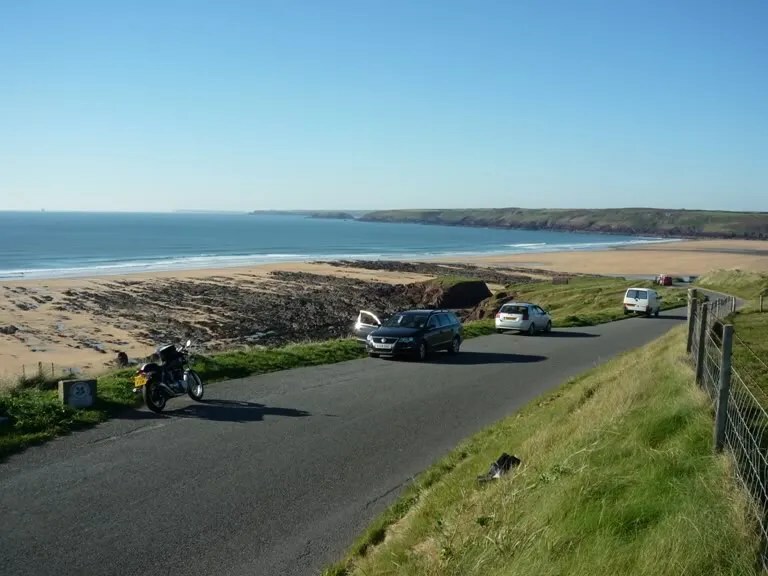 Reaching the coast, we turn south for some fish & chips with mushy peas. 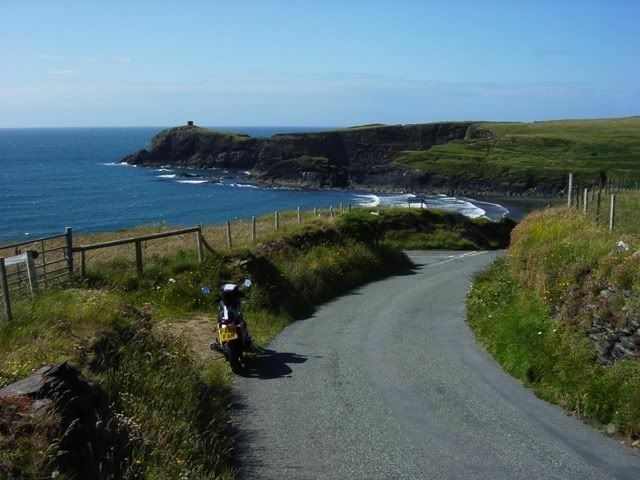 The road climbs the cliffside and for a moment, resembles California’s famed Pacific Coast Highway. 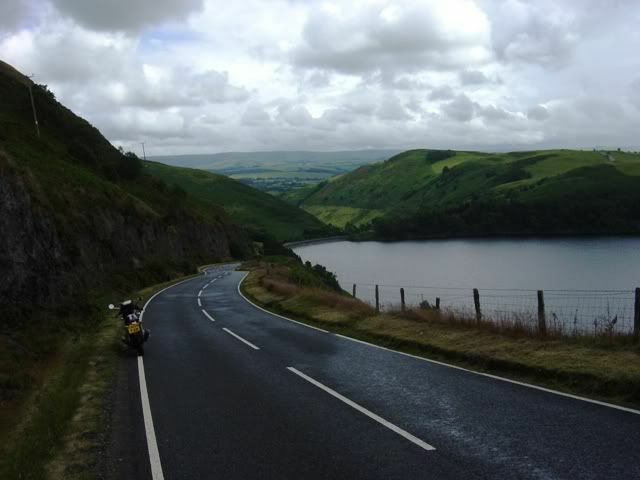 After a leisurely lunch, we turn inland towards Lake Vyrnwy. Traffic is light and the Guzzis make good time through the plethora of sweeping bends. Occasional vistas of snow dusted mountains distract us of the task at hand. We veer off onto the single track. By now, team orson is thouroghly lost and just following the locals. Snow peaked mountains gave an Alpine-ish aura. 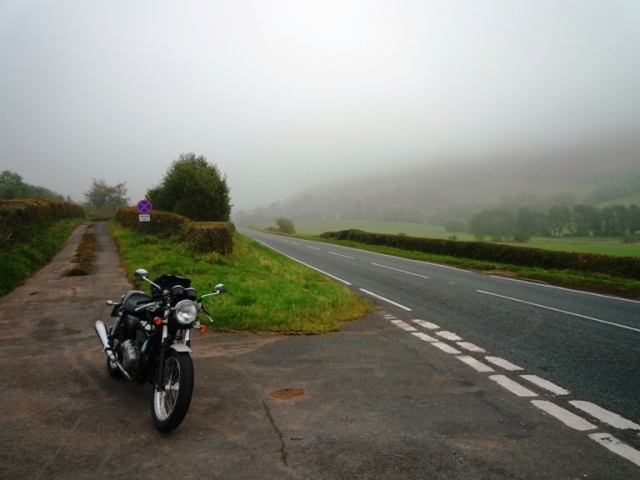 Heading back across the border into Shropshire. 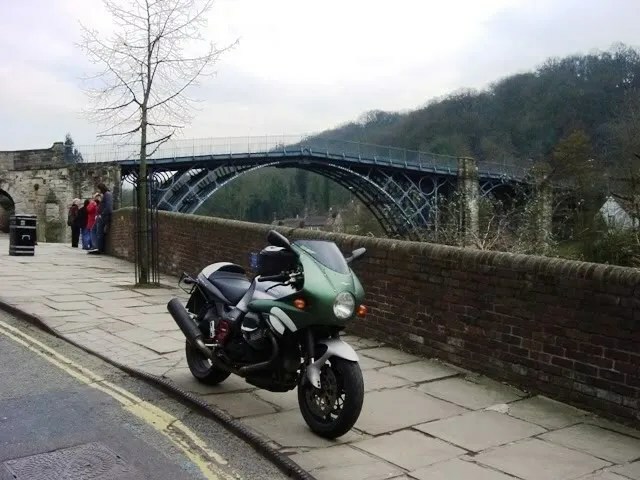 Illegally parked Guzzi in front of the first bridge to be built out of iron. 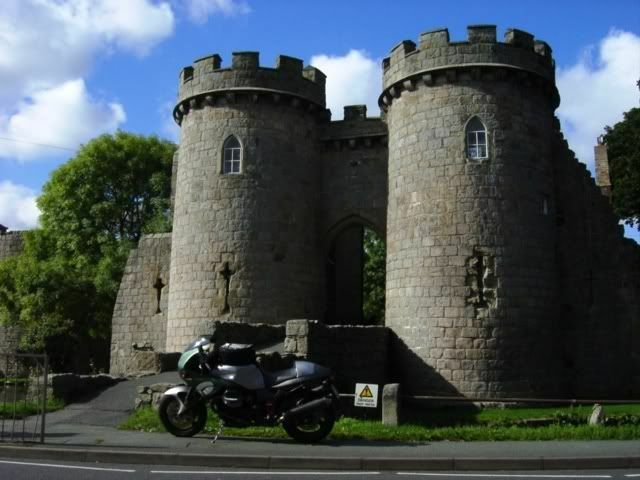 It was built in 1769 and called…uhmm…Ironbridge…near Telford, Shropshire. 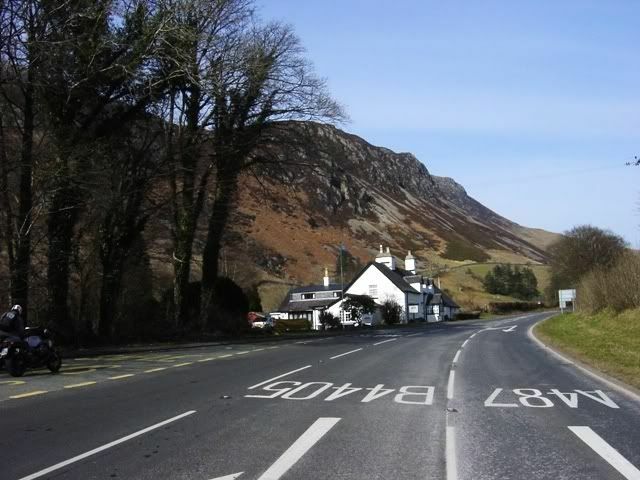 This trip served to further enhance my opinion of the Welsh highway system. A thoroughly jolly time was had by all. 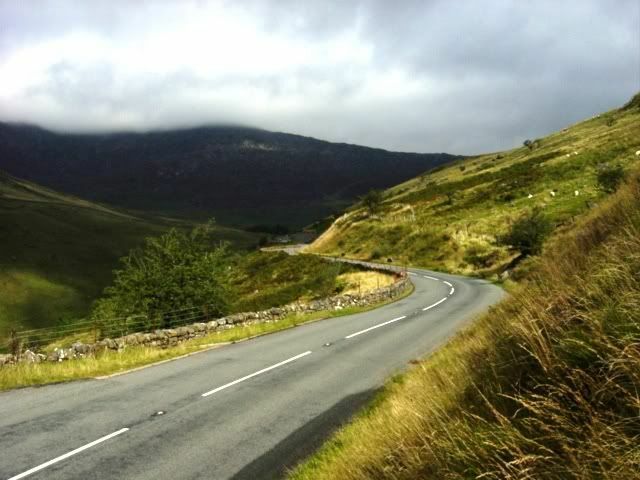 The Welsh roads deserve all the accolades heaped on them by the British motoring press. 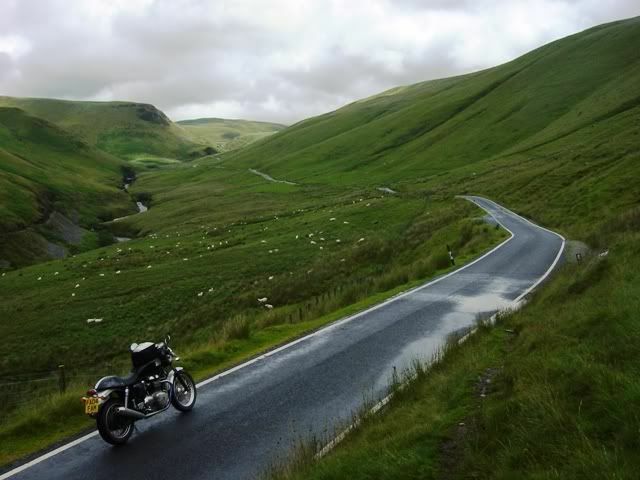 Some of the best riding in Britain! 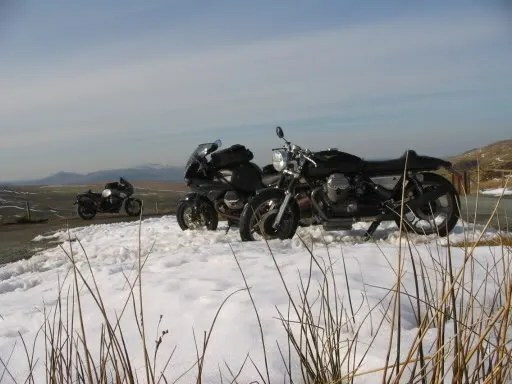 Team Orson mounts a cross border expedition into Wales. Wales most definitely lives up to the hype in British bike magazines. 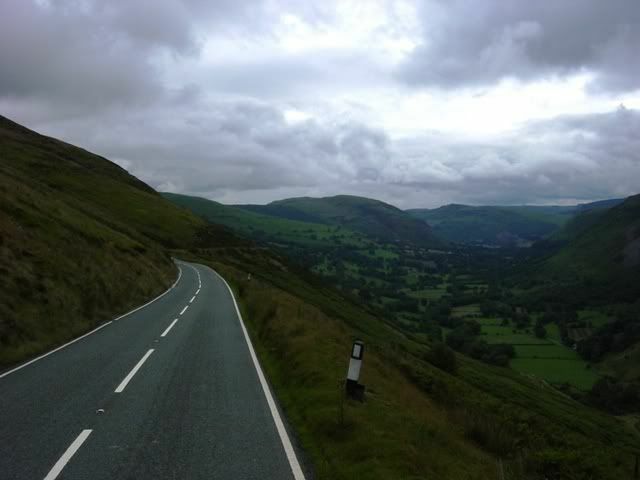 We came away thoroughly chuffed about the Welsh roads. 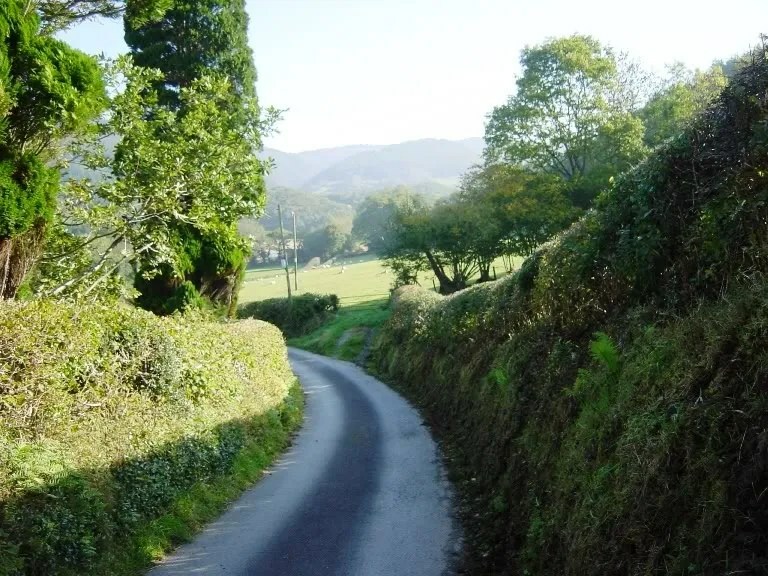 On the first day, I left the Shropshire town of Whitchurch and promptly crossed the frontier into Wales. 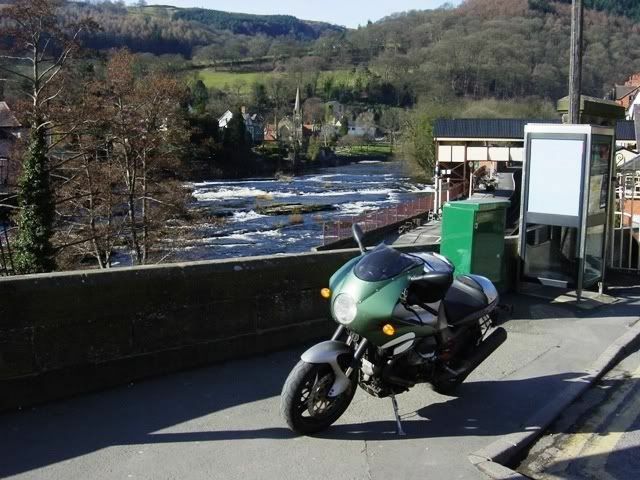 Before long I was into the Cambrian Mountains with its picturesque towns of Llangollen & Betws-y-coed. 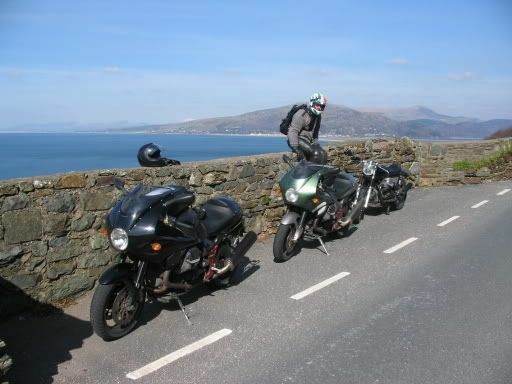 From there, I veered north towards the coast to the seaside town of Conwy and its massive Conwy Castle. 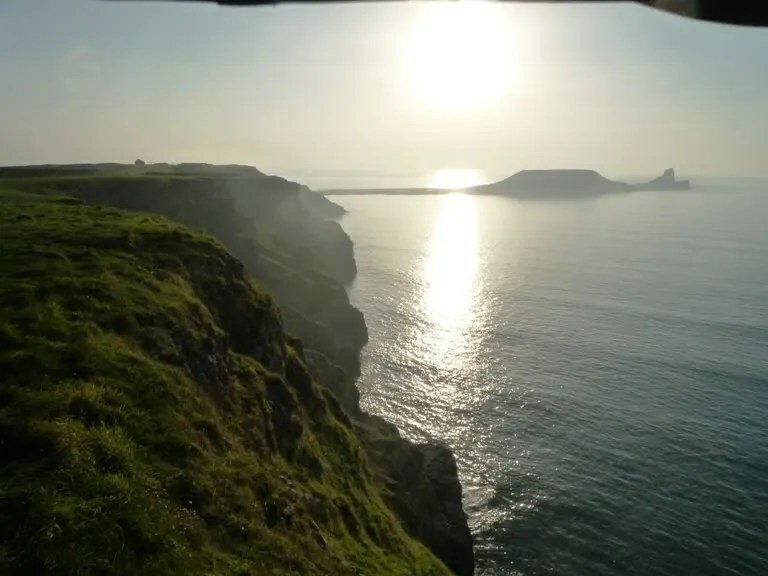 Here is a shot of the north coast of Wales. Conwy Bay looking west towards the rugged Isle of Anglesey. The following day, I had made arrangements to meet some of the lads from the v11lemans.com forum for a tour of some of northern Wales’ finest tarmac. 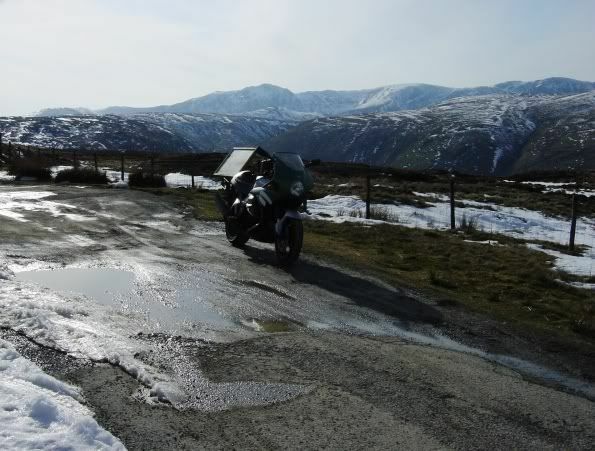 The appointed meeting place was the Ponderosa Cafe at the summit of Horseshoe Pass just north of Llangollen. 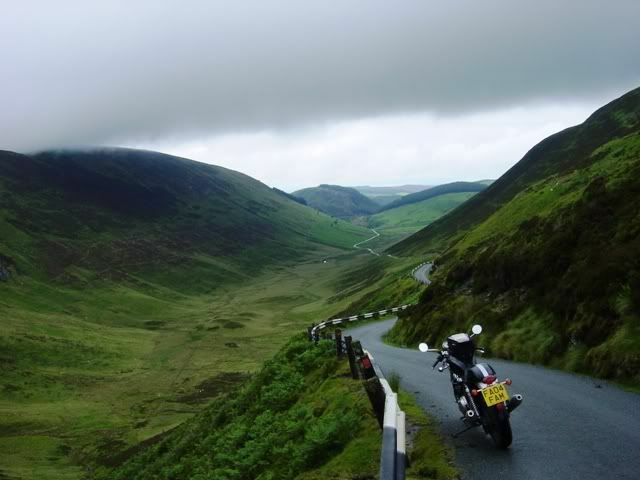 The view on the road up Horseshoe Pass to the Ponderosa Cafe. After wolfing down a full English breakfast, we made our way with local rider Baldini taking the lead. These blokes don’t dally! 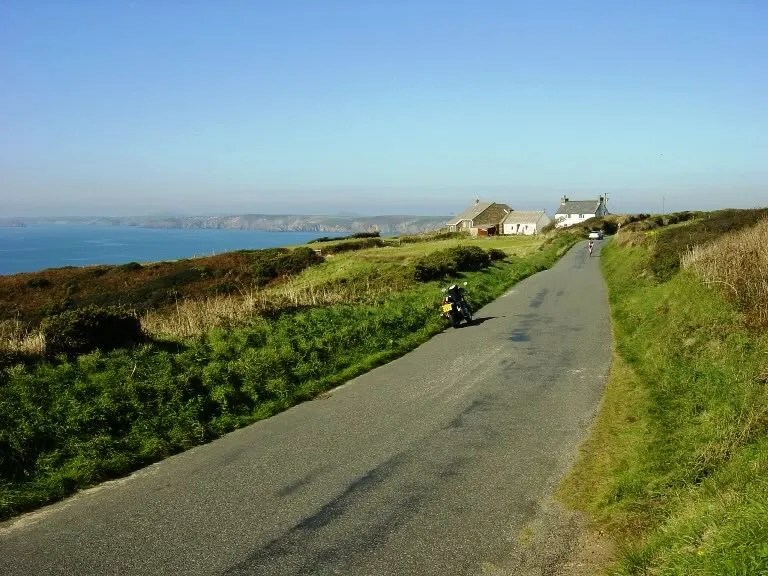 They rode quickly but not recklessly, taking good lines through the corners and none of this knee out histrionics 😀 It made things easy for me as I could see their braking points as well as which way the road was turning. 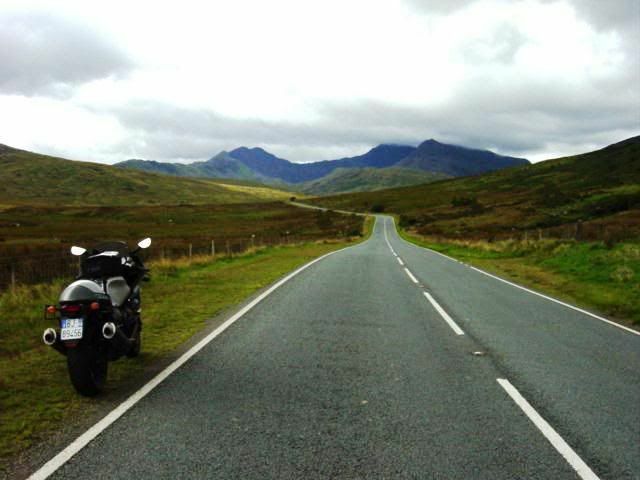 We blasted up I-5 towards the Snowdonia peaks. 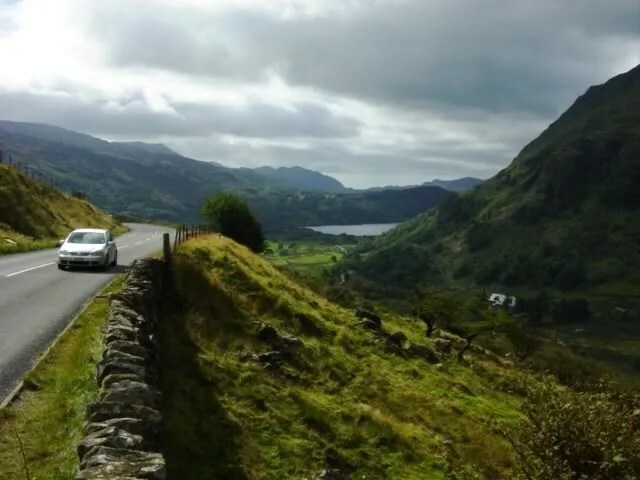 Nearing the coast near Caernarfon, we turned inland through the spectacular Pass of Llanberis. 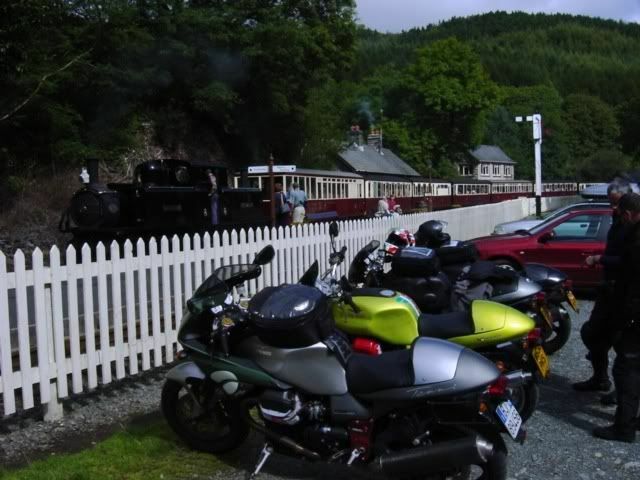 From there we headed towards the western coast of Wales, stopping for a spot of tea near a classic railroad station. Wales was full of turn of the century locomotives. Here, a flotilla of Guzzis park up for tea (or is that a gaggle of Guzzis?). 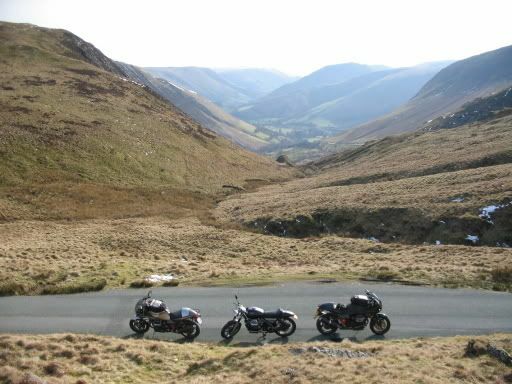 The sight and sound of 4 Guzzis roaring through the Welsh valleys really made my senses tingle. Whether the Guzzis or the locomotive have the most torque is certainly debateable. 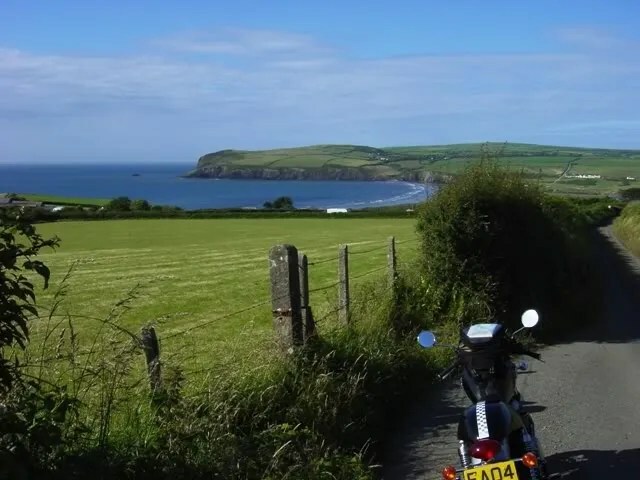 Actually, the lads are poring over a map and plotting our route after stopping in the seaside village of Llandfendigaid for another dose of fish & chips. 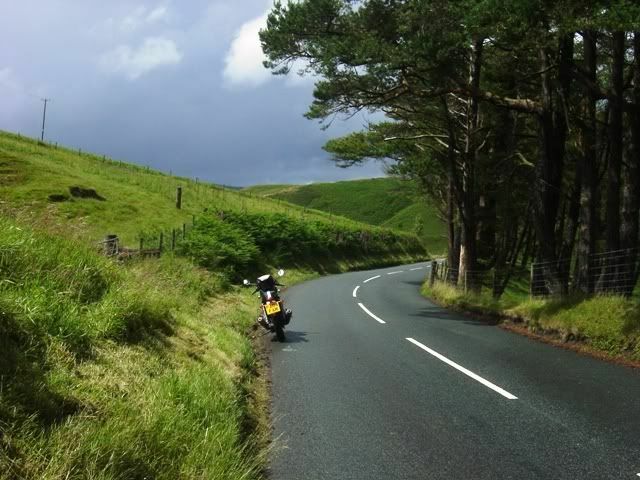 From the coast inland, the terrain really reminded me of the hills of Marin county in northern California. The roads were mostly smooth, fast sweepers which was good since Guzzis & fast sweepers go together like coffee & cream…like Lennon & McCartney…like Godzilla & Tokyo city buses…like…well, you get the picture. 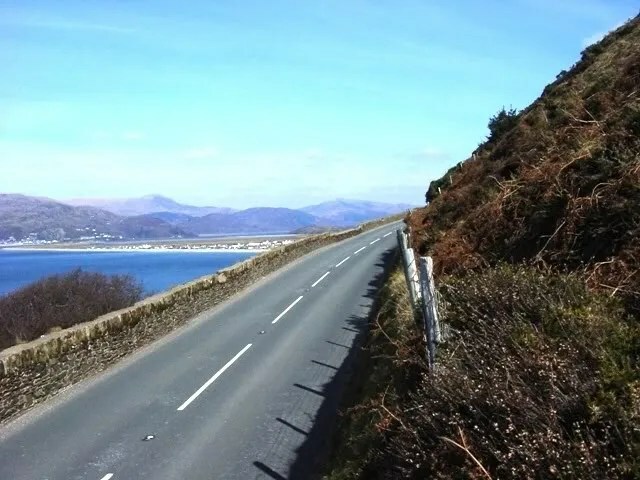 The A470 coming from the coast. 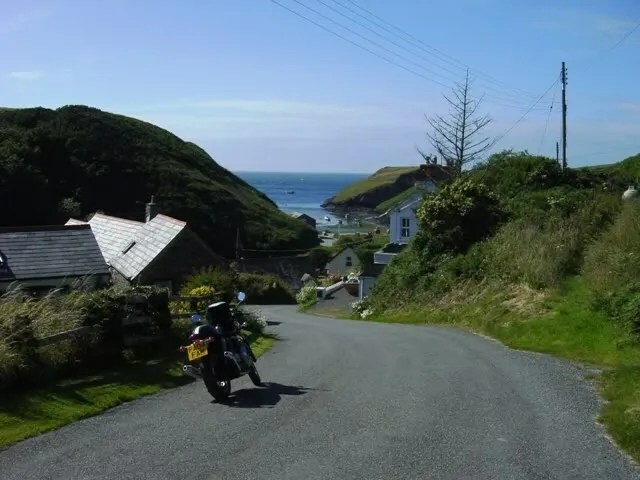 This is the part that sorta reminded me of Marin County. 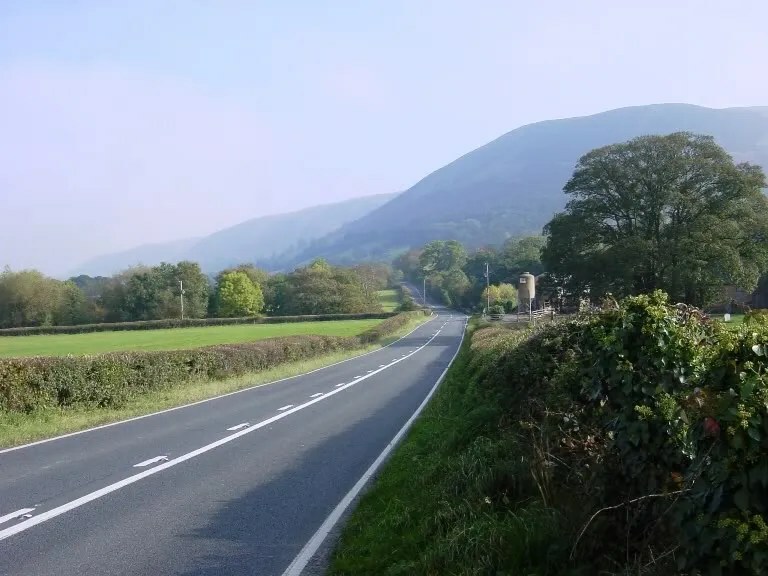 After continuing south along the coast to Aberystwyth, we turned inland, making our way to the town of Welshpool. 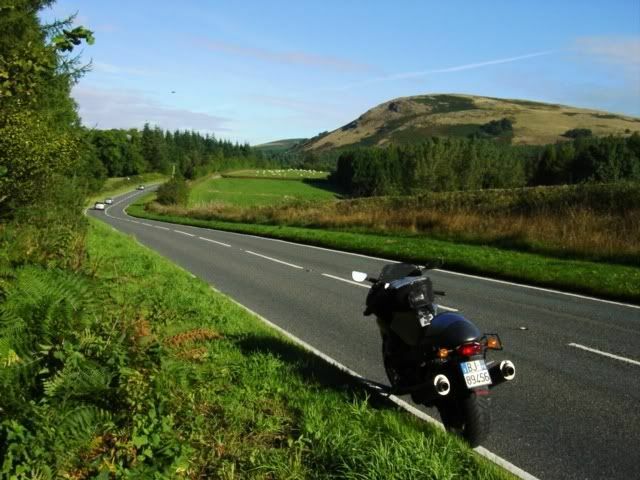 As it was a weekday, traffic was relatively light and we maintained our…ahem…”brisk” pace. 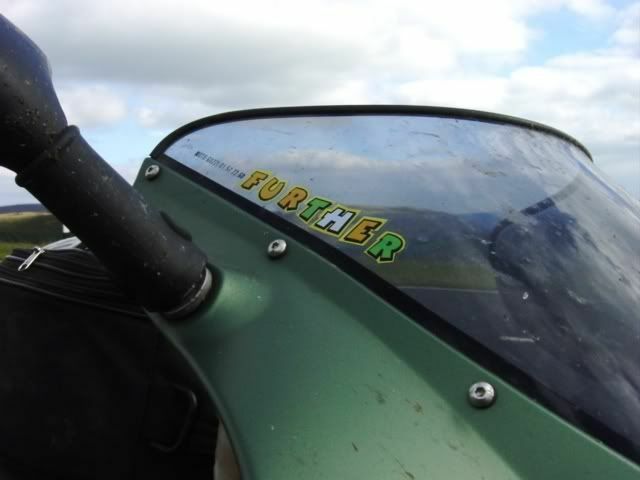 Guzzis can be ridden at a rapid clip. Don’t let the antique engineering fool you. 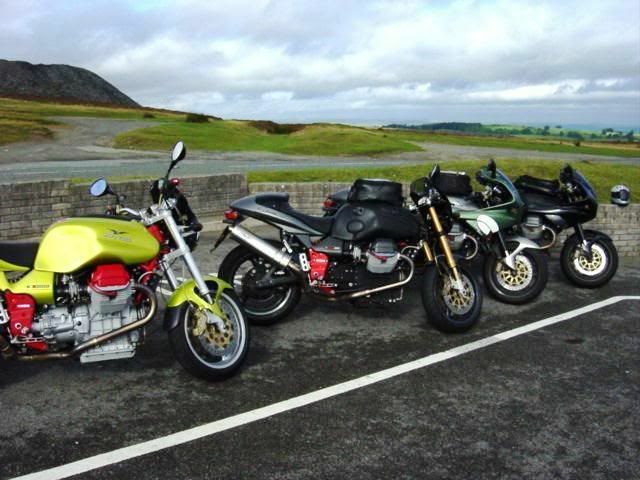 The v-twin roar only makes it that much more enjoyable…with 3 other Guzzis…it was bliss. 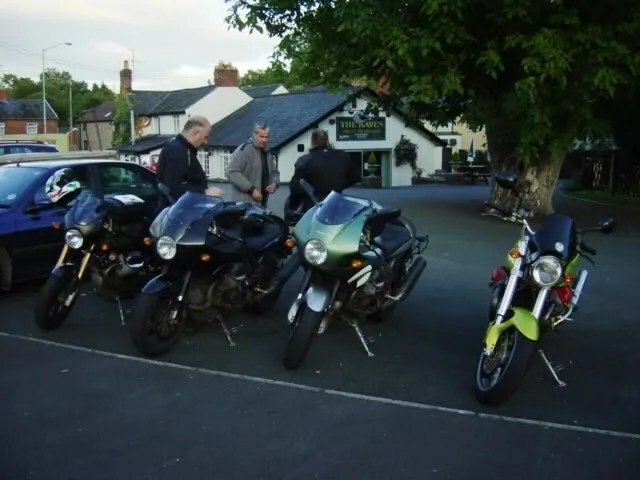 We stopped at a pub at about 6 P.M. It had been a long but exhilarating day for me. While nursing a pint, I marveled that the lads kept such a brisk pace without fear of the rozzers. I had read much about the rabid police enforcement in Wales. They said you had to pick your spots and that most of the enforcement came on weekends. From there, we bade our farewells and made our ways home. I returned to Whitchurch and promptly collapsed in bed without food or a shower. 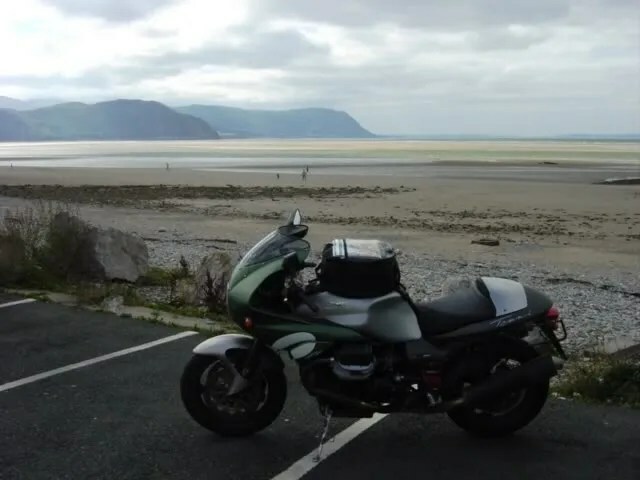 The third day, I decided to make an overnight trip to southern Wales. 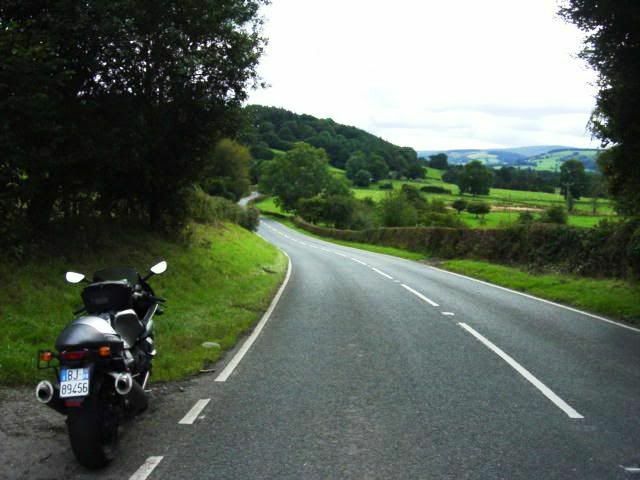 I made my way south along A483. 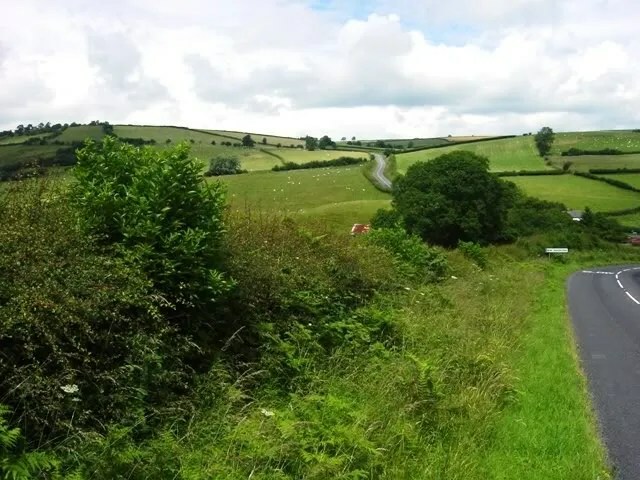 South of Newtown, the A483 turns into a rollicking rollercoaster ride. BIG fun with more fast sweepers interspersed with the occassional tight bend made for a thrilling ride. 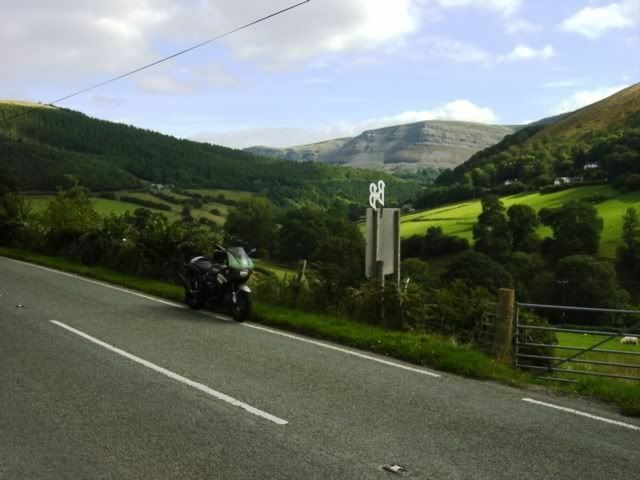 South of Brecon I was into the Brecon Beacons National Park. I made it as far south as Cetn-coed-y-cymmer before having to turn and head north if I was to make it back to Whitchurch the next day. 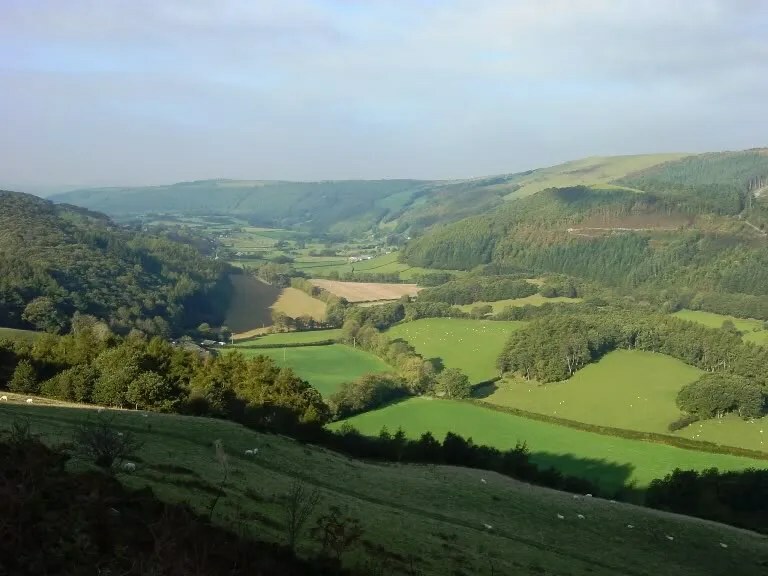 View of the Black Mountains. More fast sweepers to your heart’s content. 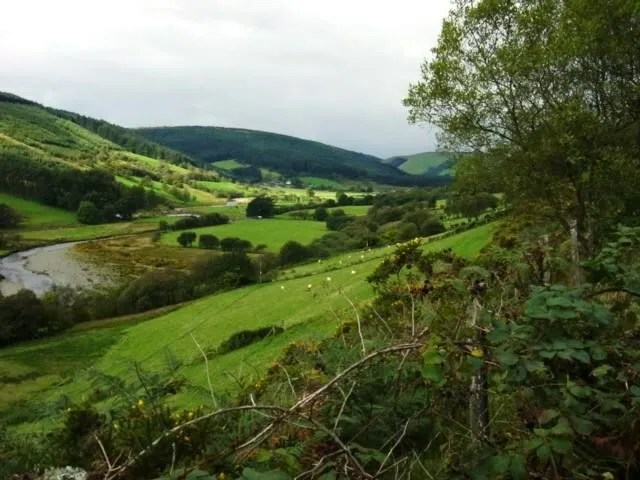 When I reached Llandovery, I started looking for a place to stay. Everywhere I stopped was full up! I suddenly remembered that it was Friday. 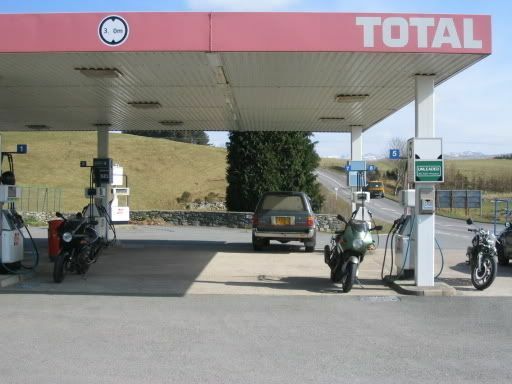 On top of that, this was the weekend that the World Rally Car boys were doing their Rally of Wales. 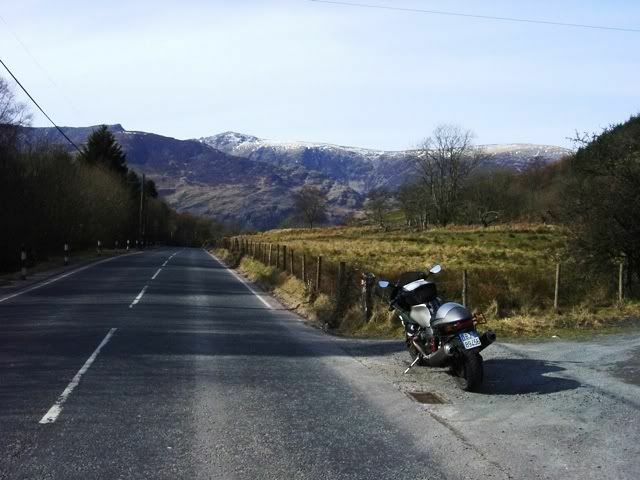 I continued north, stopping at every inn along the way with no success. Finally made it to Builth Wells which was far enough north to be away from the rally fans. I found a decent hotel with a pub downstairs (is there any other kind?). The following day would be my last. 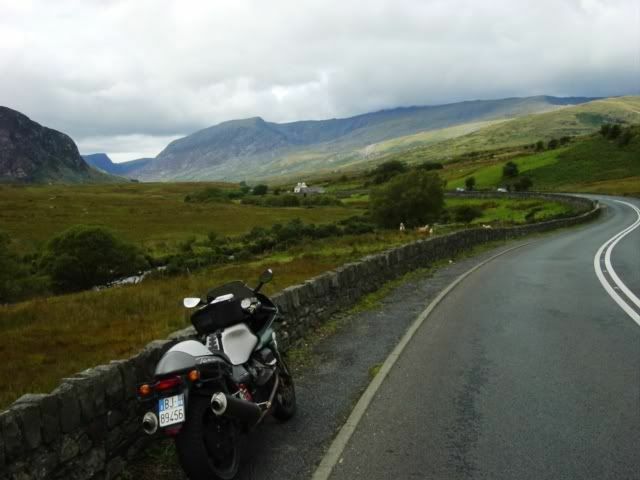 I decided to head back to Snowdonia in hopes of getting some better pictures with sunshine. That was the plan anyway. 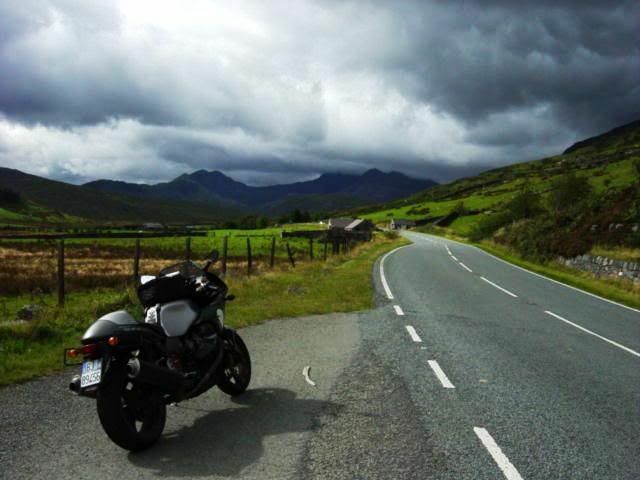 Unfortunately, as I got closer to snowdonia, the clouds moved in. Still there was no rain, so I wasn’t complaining. I continued north along the A470 through tiny quaint villages with names I couldn’t pronounce. 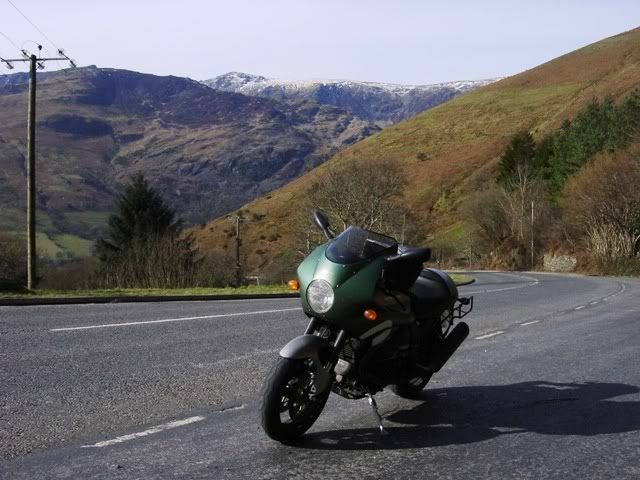 Another view of Pass of Llanberis. 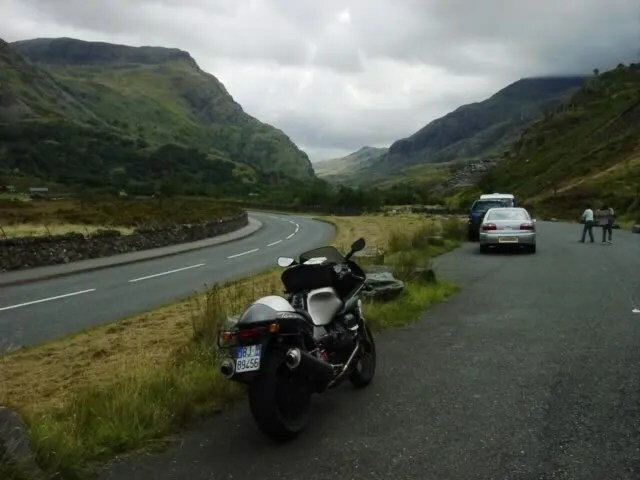 I came around the backside of Snowdonia. Impressive peaks with more fast sweeping curves. 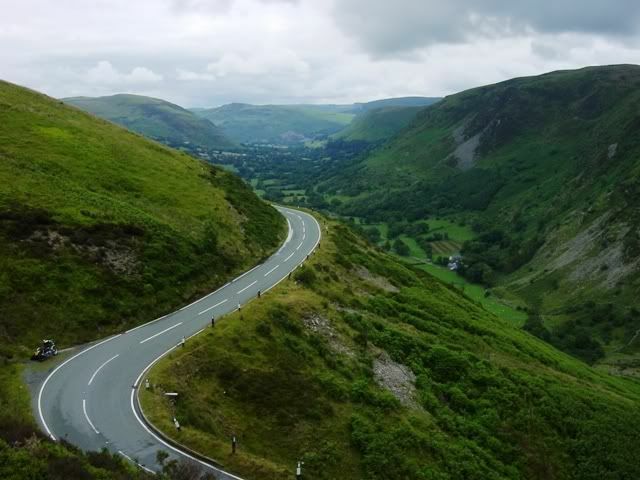 I’ve always rated Northern California roads at the top of my list, however, I’m going to have to list Welsh roads up near the top along with the south of France. Fast, smooth roads with nice scenery. All in all, the trip was a smashing success. 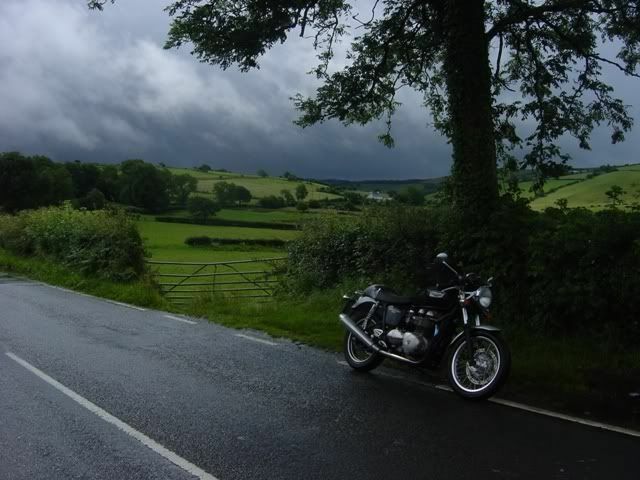 Though the skies threatened every day, I only recieved a smattering of rain. 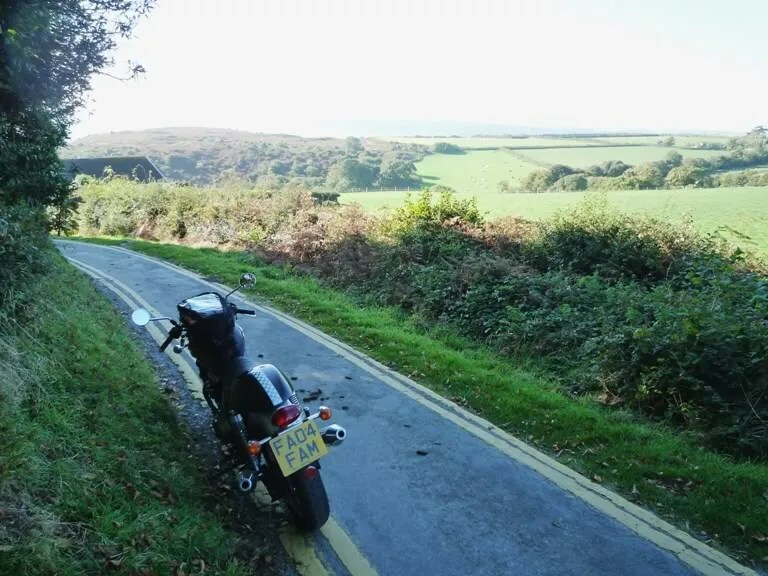 Got to learn some killer roads with the help of the local lads. About a 1000 miles over 4 days with only 1 cop sighting. I’ll definitely have to go back in the spring for a refresher course.